Here’s a couple of films set in New York, featuring some rich people. Well, that’s almost a theme. Metropolitan is a lovely film, written and directed by Whit Stillman (who recently made Love and Friendship) about the New York debutante scene, viewed from the eyes of a young man who is definitely not in that social class. As an added bonus, it starts at Christmas. One of the group, Audrey (Carolyn Farina) seems to like Tom, and they discuss Jane Austen and Mansfield Park. At one point he admits that he hasn’t read Mansfield Park, only the literary criticism of it. “That way you get the novelist’s idea as well as the critic’s thinking. With fiction I can never forget that none of it ever really happened. That it’s all just made up by the author.” I like the way the Stillman isn’t afraid to give his ‘hero’ dumb opinions. It’s a very sweet film, and I’d recommend it to anyone who likes a bit of light comedy. On the other axis of Manhattan comedy, it’s The Bonfire of the Vanities. It’s based on the first novel by Tom Wolfe (who wrote The Right Stuff and many other classic works of non fiction) and the novel was much beloved by the literary set, so the movie was eagerly awaited. 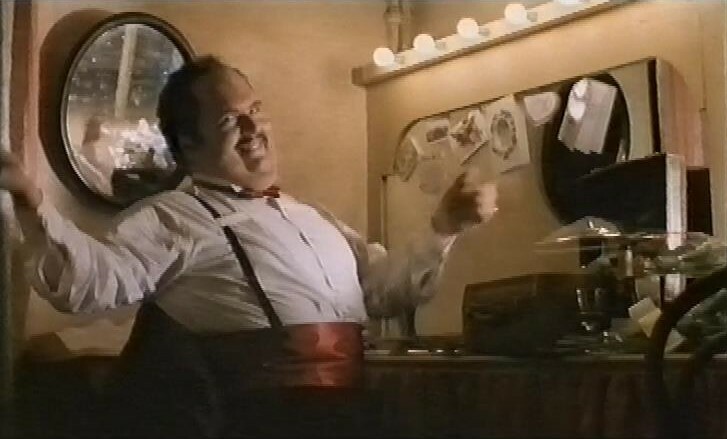 It’s was big budget, an all star cast headlined by Tom Hanks, and directed by Brian De Palma. Perhaps de Palma wasn’t the best choice to direct a sharp literary comedy about the glitterati of New York. He hasn’t made much comedy since Phantom of the Paradise, and although that one has a lot of admirers, it’s not the funniest movie in the world. The opening apes the opening of his later Snake Eyes, a long single steadicam take from an underground car park, through the back of a hotel, with Bruce Willis as the writer Peter Fallow, who has written the story we’re about to see, being ushered up to an obviously important affair, while being totally drunk and completely obnoxious. The story he wrote was about Sherman McCoy (Tom Hanks). He’s a powerful investment banker, dubbed by Wolfe (and Willis) a Master of the Universe, who’s having an affair with Melanie Griffiths, to the annoyance of his wife Kim Catrall. In a weird way this story wouldn’t play out the same today as it did. The two events that spark it off are Hanks, taking his dog for a walk in the rain in order to ring Griffiths from a payphone, and accidentally dialling his home number, tipping Cattrall off about the affair. And then, when he’s driving Griffiths home from the airport, he misses his turn off the freeway, takes the next one, then gets lost in an ‘undesirable’ part of town. He’s accosted by two black men, Griffiths panics and drives at speed, possibly hitting one of them. 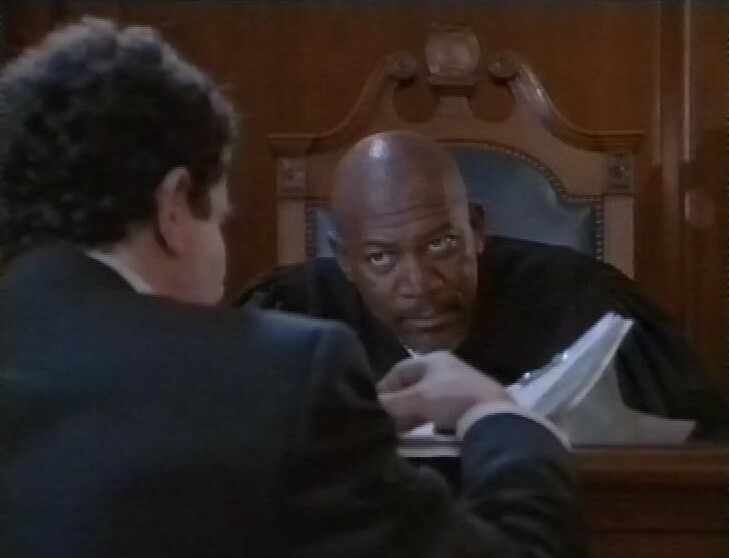 Then we visit Morgan Freeman’s courtroom. He’s a judge, and he explains for our benefit that it’s an election year, and the District Attorney is looking for a high profile white defendant to offset charges of racism against the department. I wonder if you can tell where this story might be going? We’re also introduced to the Reverend Bacon, a very thinly disguised version of reverend Al Sharpton, played by John Hancock. Note the film’s frankly annoying over-use of extreme wide angle lenses. They’re everywhere. I think one of the main problems is that the novel is one of those sprawling tales, with lots of characters, which is fine in a novel but hard to compress into a movie. Plus, so many of the principals are horrid right from the start, that it’s hard to have sympathy for them. Even casting Tom Hanks as Sherman McCoy, the most likeable actor in Hollywood, doesn’t really make you that sympathetic to him. To be honest, the film isn’t great. What I would recommend, though, is Julie Salamon’s book about the making of the movie, The Devil’s Candy. It tells a story about a movie out of control, and it’s far more interesting than anything in the movie. One story it tells is how De Palma had a second unit crew sent out to film Concorde landing at sunset. The crew were there for weeks waiting for a landing at just the right time, and as the budget grew, they bet De Palma the shot wouldn’t make it into the movie anyway, Since De Palma has final cut, he won that bet. After the movie, there’s the start of another, Into The Sun starring Michael Paré. Looks like a cut-price Top Gun rip-off. The tape ends shortly into this film. 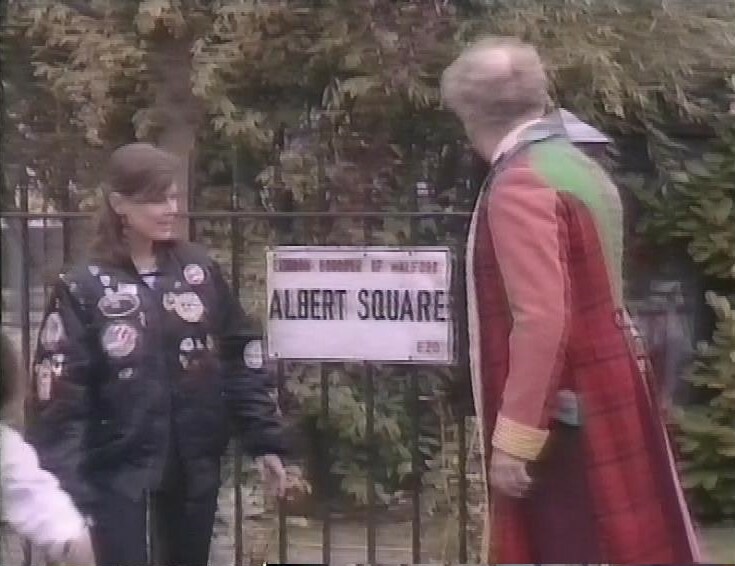 Before the first episode here, there’s a bit of old Eastenders courtesy of UK Gold. Then, Law & Order. This is the next episode after Spoil of War which we looked at recently. There’s a murder at the community. A young girl was stabbed, after they had a party. Suspicion falls on young Barney, who has learning difficulties. But it’s comedy Welshman Tom Price who’s the real perpetrator, having got drunk and horny after the party. But he lets the group think it’s Barney, and they decide he’s guilty, and that he should be executed. And when the deed is done, Price is overcome with guilt and admits it was him to Greg and Abby, and they realise that, after the big trial and sentencing they’ve just enacted, it would destabilise the community too much to reveal this, so they have to keep it quiet. Possibly the grimmest hour of television I’ve seen recently. The next episode is The Future Hour. Greg and Paul meet a man called Huxley, who has been collecting supplies from towns, and trades them for gold. Two of the people with him have left him, taking some of his gold, so he’s looking for them. One of them is played by Denis Lawson. The next episode is Revenge. Vic Thatcher is depressed about his lack of use to the community, and attempts suicide. Greg and Paul go scavenging, and find a wheelchair for him. They want to persuade him that he’s still valuable to the group. And a couple arrives, driving a petrol tanker that’s half full. But it gets awkward when Greg recognises the woman. It’s Anne, the woman who had been with Vic when he got his legs crushed, and who had left him at the quarry, telling Greg he’d died. She wants to leave immediately, afraid of what Vic might do in revenge, but her partner wants to stay. Vic tells the group what’s done is done, but makes sure they all know what happened. That night, he drags himself up the stairs to where she’s staying, to find her at the top of the stairs with a scythe. But they manage to survive each other, and she leaves in the morning. 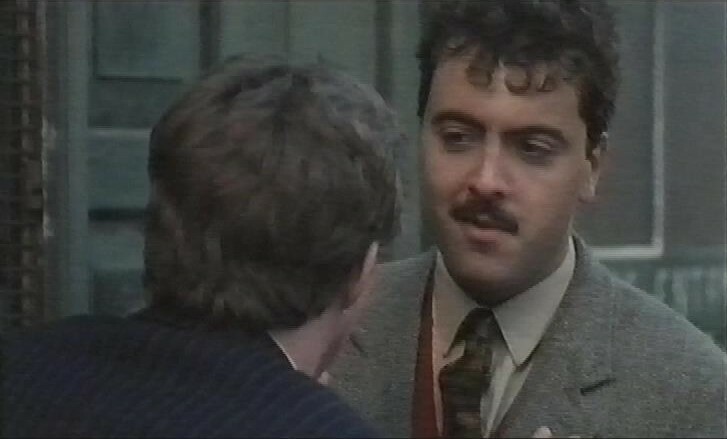 I was slightly thrown by the fact that Vic was played by a different actor here (Hugh Walters) than previously. I wonder if this was actor availability, or whether the production team preferred a stronger actor in the role for this episode that focused on Vic. The next episode is Something of Value. A man called Lawson arrives, claiming to be a loner, but he’s actually scouting for scavengers, and is delighted to find their petrol tanker. He brings his two friends back to steal it, but Greg and Jenny have taken it to a nearby settlement to trade for seeds and food, after their was ruined by a flood. On the way, he discovers the brakes on the tanker have corroded, and almost crashes. He sends Jenny back to get tools, and the three scavengers grab her, and there’s a bit of a siege before they grab the tanker and drive off, unaware of the brakes problem. They crash, two of them are killed, and the third injured man tries to empty the tanker onto the road rather than let Greg have it, so Greg shoots him. It’s another quite grim episode. The recording ends after this episode. 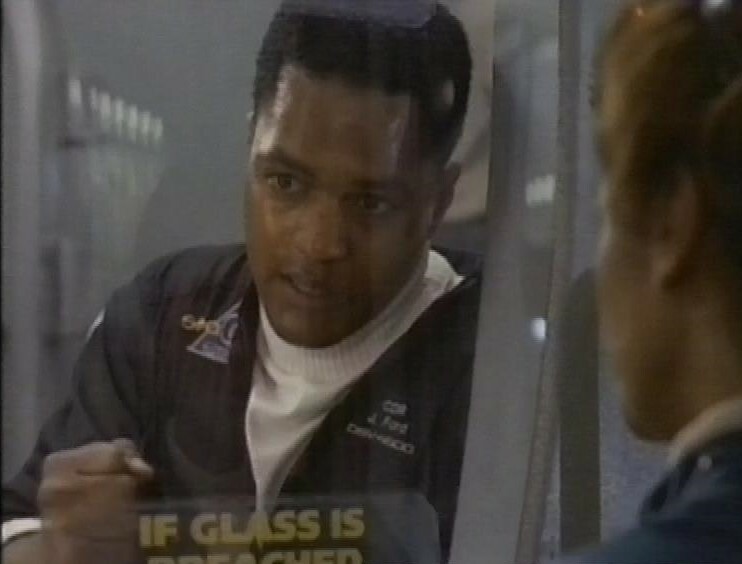 More Seaquest DSV, and the ship has been sent to shutter a deserted undersea munitions cache, when they are targeted by the supposedly empty outpost. The outpost is populated by the children who were left there when their parents died. The SeaQuest crew are enormously condescending to the children. The leader of the kids captures some of the crew in a ball pit. In the next episode,the crew arrive at a research station to relieve the crew, but find all of them (but one) dead of unknown causes,possibly a virus. They had found the remains of a space station that crashed into the ocean, so there might be an unknown virus. The rescue crew have to be put into quarantine, and they go a bit stir crazy. The next episode is a bit of a ghost story. Bridger sees some visions of a ship lost long ago. For a science fiction series, it does like its supernatural, woo-filled stories, what with the ESP episode on an earlier tape. 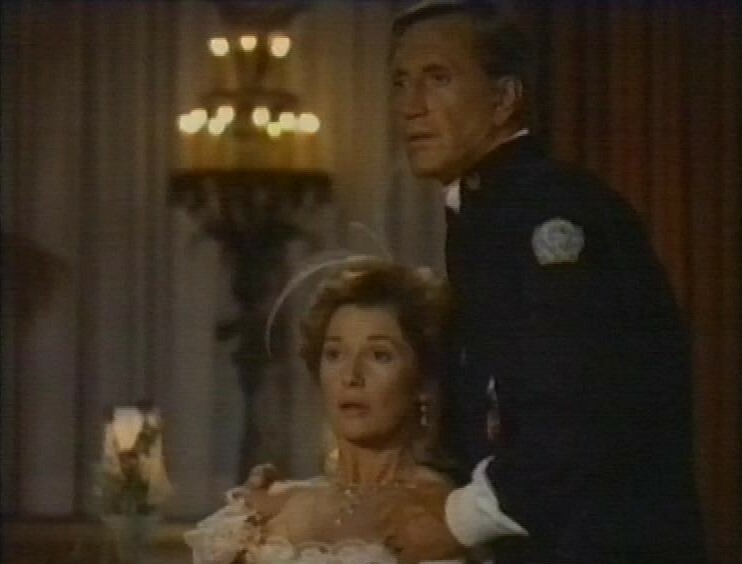 Dr Westphalen gets possessed by the spirit of a woman who has to reconcile with the captain of the ship to make everything better. And as if that’s not enough, the next episode has the SeaQuest in the Bermuda Triangle. They have to rescue a sub full of children (why is it always children?) and four of the crew are adrift in the Sargasso Sea in a lifeboat. After this, there’s the very start of You’ve Been Framed, and the recording ends. First today, Hear My Song, in which Adrian Dunbar runs a dance hall, but isn’t quite successful at booking the big acts. The group that owns the hall are going to sack him, but then he manages to book legendary Irish tenor Josef Locke, who has been unable to perform publically in Britain because he’s wanted for tax fraud. William Hootkins plays Locke. 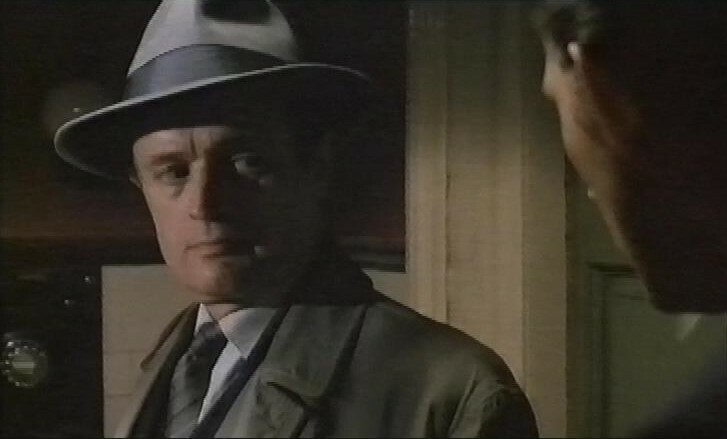 David McCallum is the police inspector who has been pursuing Locke. But he tells Dunbar that this Locke is a fake. Another person who knows Locke from time gone by is the mother of Dunbar’s girlfriend, Shirley Anne Field, who had a brief affair with Locke years ago. And when she tells the assembled audience that Locke isn’t Locke, Dunbar’s dancehall collapses into debt. So he returns home to Ireland where, with the help of old friend James Nesbitt, goes looking for the real Josef Locke. 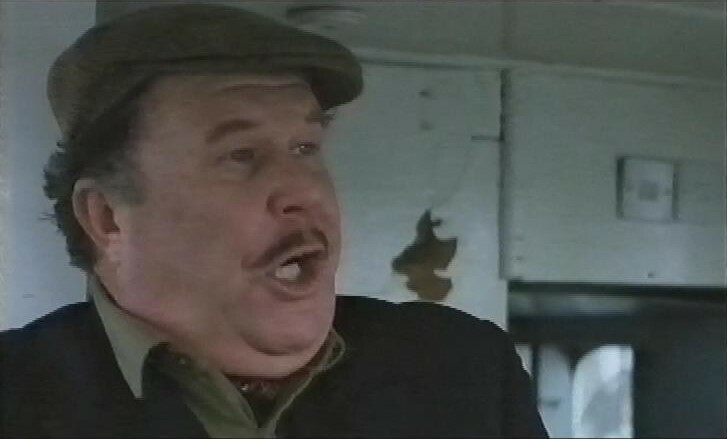 They find him in the shape of Ned Beatty, and after a bit of curmudgeonly sparring, Dunbar persuades him to come to the UK for a performance. It’s a fairly slight film, but it’s based on a true story. After this, recording switches to BBC2 and Quantum Leap with the episode Lee Harvey Oswald. After a montage of pictures of John F Kennedy and Oswald growing up, it finishes to the famous picture of Oswald holding his rifle, and that’s the point at which Sam jumps into him. But this jump is different. Sam can speak Russian. Over the course of the show, Sam keeps leaping into different stages of Oswald’s life, and Oswald’s personality keeps taking over Sam’s. Al thinks he’s there to uncover the conspiracy. The tension mounts as he leaps closer to the event. Will Sam be able to change history in a profound way? But the ending is neat and clever. At the last minute, as Sam is still under the influence of Oswald’s mind, Al gets through to him and he leaps into the body of a secret service agent, who prevents Jackie Kennedy from also being killed by Oswald – as had happened in the pre-Sam Quantum Leap history. Historical note: This episode was broadcast on the 30th anniversary of the assassinatiob of JFK. After this, there’s a trailer for The Buddha of Suburbia. 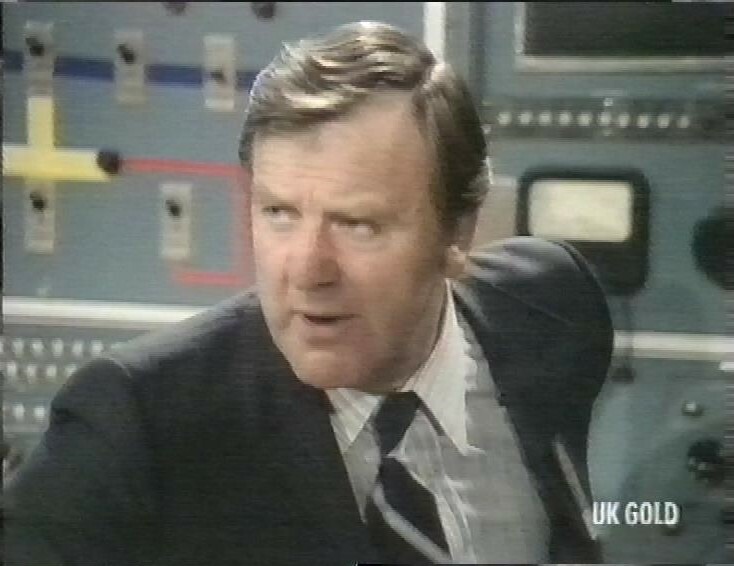 Then, an episode of Inside Victor Lewis Smith, a rather less successful radio-TV transfer than KYTV. It was always going to be hamstrung by VLS’s reticence to actually appear in-vision, leading to a very poor framing device (him in a full-body bandage) that doesn’t lend itself to many good jokes. 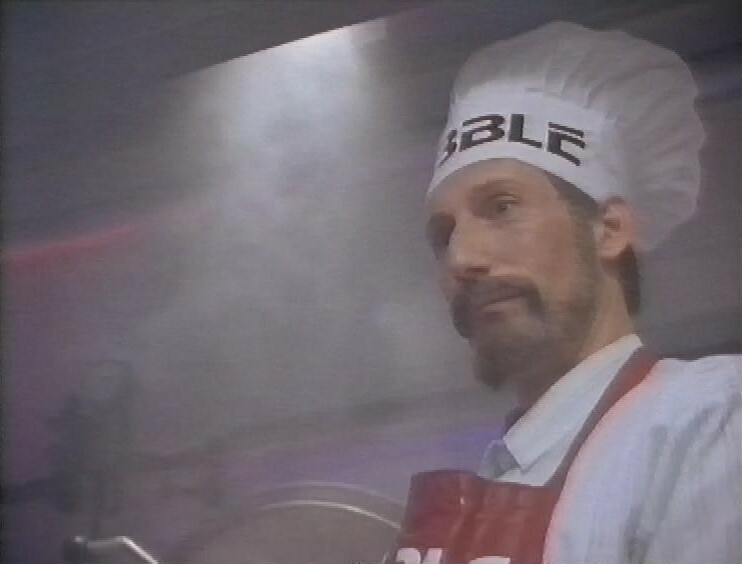 Featuring in this episode, Chris Langham. Recording stops just after this programme. The first episode here is The Passenger. Kira and Bashir are returning from a mission, where Bashir is overly pleased with himself and his skils as a Doctor. They answer a distress call. There’s a prisoner on the ship, who started a fire to escape, along with the person accompanying him. 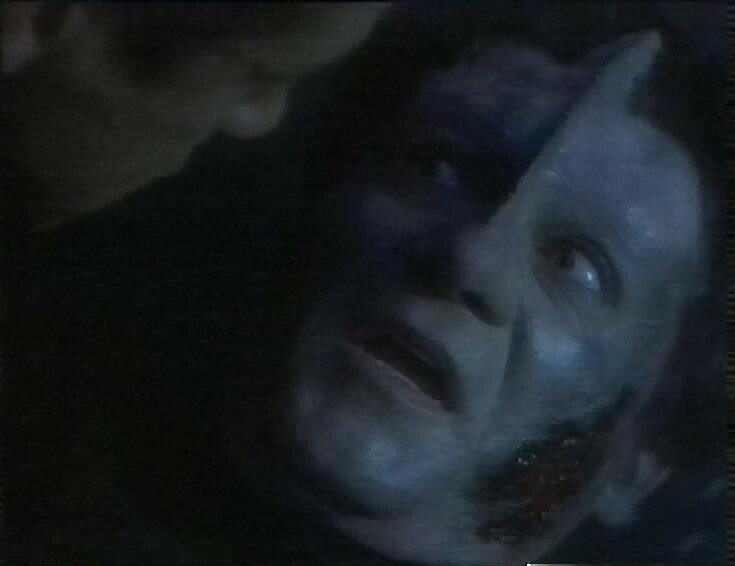 The prisoner dies before they can bring him back to the runabout, but not before he grabs Bashir by the throat and croaks “Make Me Live”. Despite dying, and being on a slab in the morgue, the bad guy still appears to be active, trying to steal a duridium shipment. And he even threatens Quark, although we don’t see his face. Dax thinks that the bad guy, Vantica, has transferred his consciousness to his captor’s brain. How strange that the plot of this episode is vaguely similar to the SeaQuest episode on a recent tape. 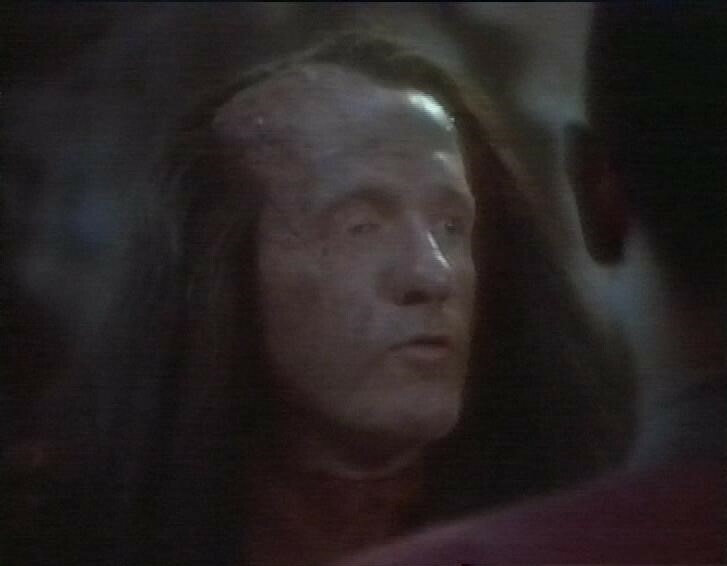 His captor, Ty Kajada, is once again played by Caitlin Brown (from Babylon Five). It shouldn’t surprise anyone to learn that it’s actually Dr Bashir who’s hosting Vantica’s mind. This was a short period where Sky occasionally had an in-vision presenter doing continuity, so not only are they talking over the end title music, they’re squeezing them too. This is Amanda Haslam, by the way. The next episode is Move Along Home. Sisko and Jake have a heart ot heart about women, when Sisko learns that Jake has been getting advice about women from the Ferengi Nog. A new race, called The Wadi, arrive on the ship, and only seem to be interested in games at Quarks. They look like gamers to me. They seem to win a lot. Quark’s game must be very badly designed if the house doesn’t have a statistical edge. Quark tries to fix the Dabo table, and the aliens bring out their own game to start playing. Then suddenly, Sisko is somewhere he’s never been. He’s somehow trapped in the game. As is Bashir, Dax and Kira. This episode is basically an extended edition of The Adventure Game, but with the possibility of death. Except that there’s no possibility of death really. 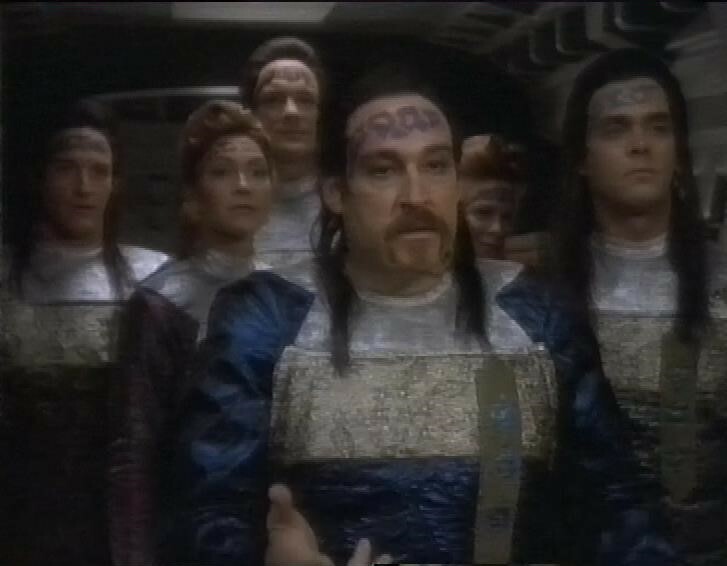 Next, it’s The Nagus. The Grand Nagus of the Ferengi arrives, to convene a meeting of lots of important Ferengi. 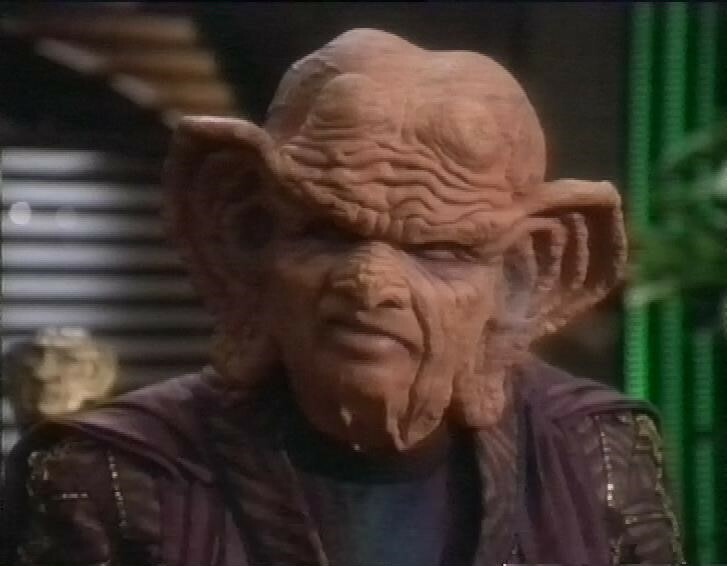 And during this meeting, he announces his retirement, and nominates Quark as the new Grand Nagus. Wallace Shawn plays the Grand Nagus. In the B-story, Nog is quitting school, and Jake’s upset because he still wants to be friends. Sisko gets worried that he’s spending so much time with Nog, and when Jake doesn’t turn up for dinner, he goes to find him and bring him home. But he discovers Jake and Nog in a cargo bay, with Jake helping Nog learn to read. Next, it’s Battle Lines. 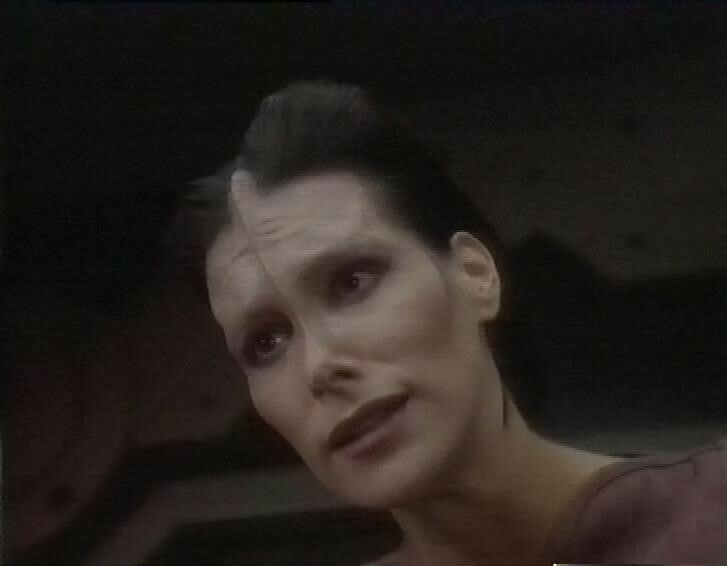 Kira is outraged that the former Cardassian prefect’s reports on the station describe her as a ‘minor operative’. 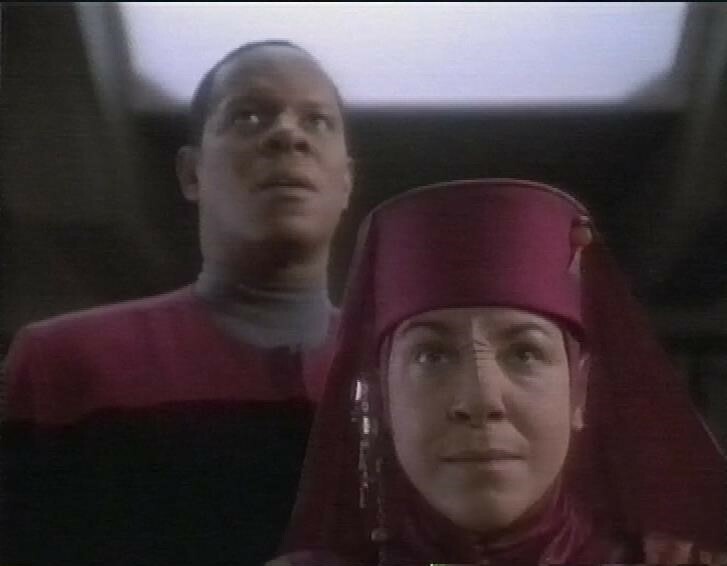 But then she gets to show Kai Opaka, spiritual leader of the Bajorans, around the ship. Sisko and Bashir join them for a trip through the wormhole because she’s never seen it, apparently. Although, if the station orbits Bajor, and the Wormhole is outside the station, wouldn’t the whole planet see it? The ship they’re on gets into trouble, crashes on a planet, and Opaka dies in the crash. Plus, there’s bad people on the planet. Two sides, the Ennis and Nol-Ennis, are fighting, and have been for a long time. The leader of the Ennis is played by Jonathan Banks, Mike from Breaking Bad. Then Kai Opaka turns up, alive again. Something on the planet regenerates the dead, which has made the fighting rather grimmer and long-lasting than normal. Bashir discovers that anyone revived by the planet cannot leave without dying, so Kai Opaka decides to stay, and attempt to bring the two warring factions together. After this, recording stops, and underneath there’s part of 2000 Malibu Road. I’m glad I’ve got the odd episode of Tomorrow’s World here. I wish I had a few more. They can sometimes be fascinating. This one is Doctor Who themed, presumably to tie in with the (rare) repeat of a classic Pertwee serial after it, and to tie in with the programme’s 30th anniversary. 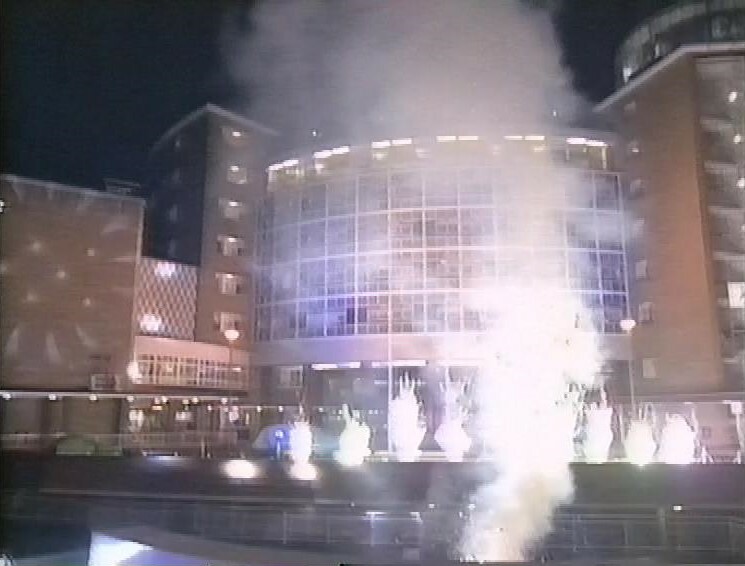 The opening is brave for a live show – fireworks set off behind a prop wall, in front of Television Centre. That Tardis prop is in a bad way – conspicuously missing the “Free for use of Public” plaque. There’s some archive footage of Raymond Baxter. Only joking, he’s really in the studio, in a lovely fakeout. They’re having fun with this episode. 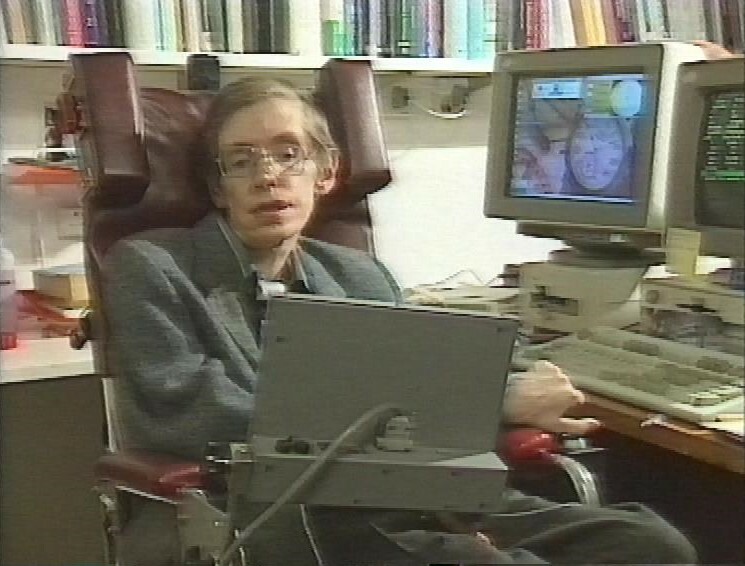 Then Professor Stephen Hawking comes along to pour cold water on the idea of travelling into the past. He’s such a spoilsport. There’s a piece on pretend skydiving above a huge fan, and a piece on research into cot death. Then, Raymond Baxter presents a look at his old report on Pong from 1973 as a lead-in to a piece on VR. And there’s a scary piece about underground tyre fires. After this, there’s a trailer for Saturday programmes on BBC1. Then, before the first episode of Doctor Who: Planet of the Daleks there’s a special extra programme looking at the origin of the Tardis. They lose points for including footage from one of the Peter Cushing films. Then, episode one of Planet of the Daleks. Clearly, we’re continuing on from events at the end of the previous story (Frontier in Space) with The Doctor incapacitated. 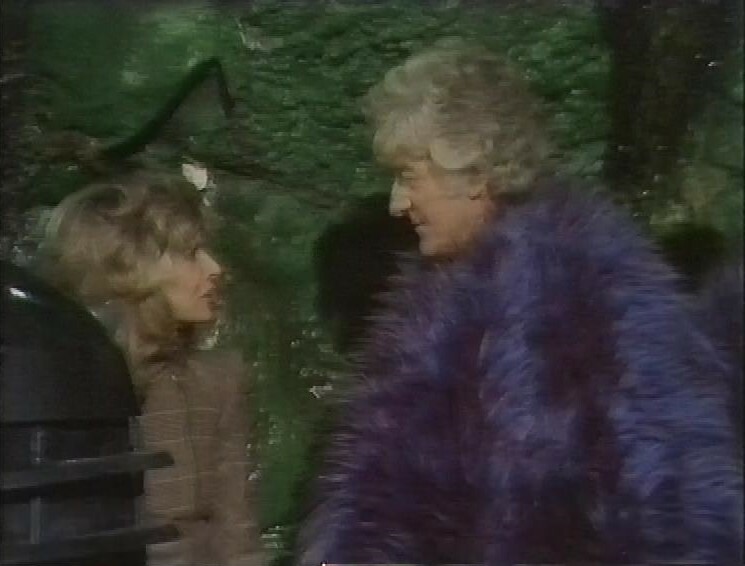 Jo Grant (Katy Manning) gets him into the Tardis, but he’s not making much sense. He sends a telepathic message to the Time Lords, then collapses. 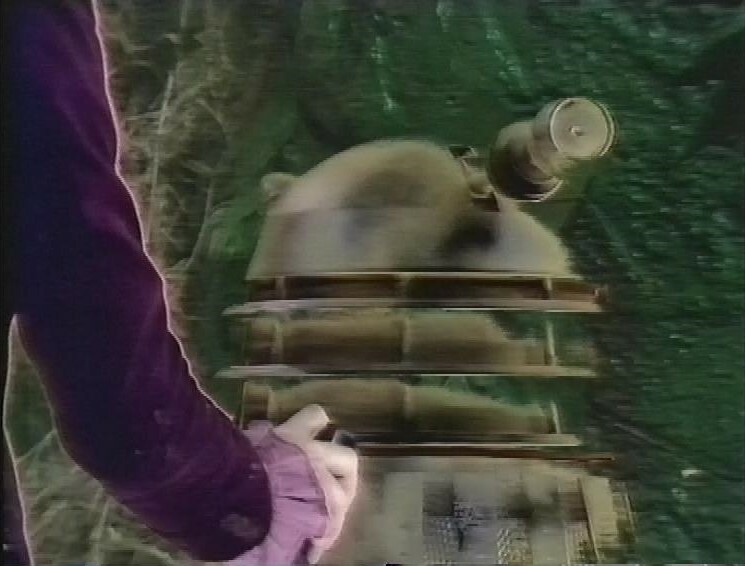 The Tardis lands on a planet, and the Doctor tells Jo to record everything in the Tardis log, a dictaphone-type device. I’m not sure if this serves any purpose than to allow Jo to narrate her solo scenes. It’s a very… moist planet. All the plant life seems to consist of large, ugly flowers that spray some kind of noxious substance over anything that moves. It’s a really good thing Jo remembers to take her raincoat. I like the fact that Jo has to take the initiative, which offsets her usual role as the one asking lots of questions. Having to narrate her log entries shows her being smart and analytical, which she rarely gets a chance to do. The jungle set is satisfyingly dense and thick, making a virtue of a small studio space. Everything’s shot very close, but it makes sense visually because you feel like you couldn’t get much distance in such a think jungle. Jo discovers some kind of vessel. Inside, there’s someone in a seat, but when Jo taps him on the shoulder he slumps over. It’s a pity that, as she’s approaching, he’s wobbling about quite noticeably. Meanwhile in the Tardis, the Doctor recovers from his malaise, and wonders why the Tardis is running on its stored oxygen supply when the external atmosphere is breathable. He also can’t open the doors. 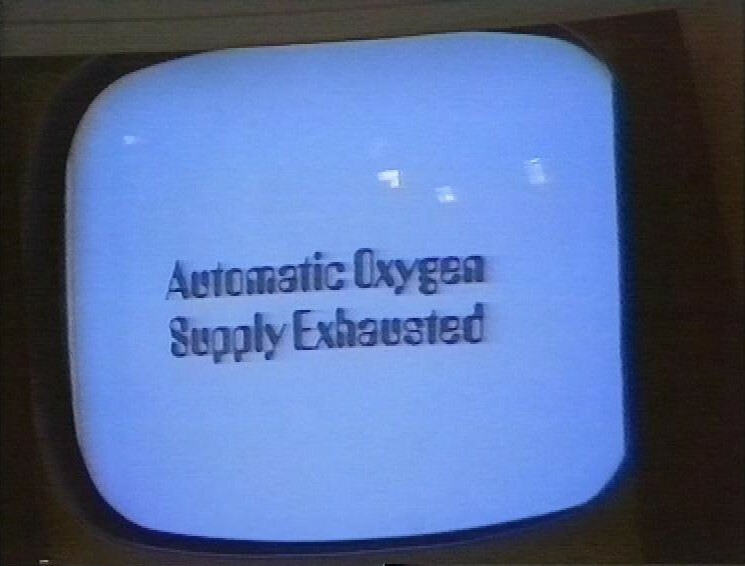 Then, crisis, as the automatic oxygen supply is exhausted. Lovely font for the warning, from a time when people imagined that computers would have to use computery fonts. Some sleuthing led me to the Bitstream font Amelia. Jo is now hiding in the ship – it feels like we’ve lost s scene. Men wearing padded suits and blond hair find her and look menacing. The one on the left is Prentis Hancock off of Space 1999. They’ve never heard of Earth. She asks for their help for the Doctor. Another blond man turns up. I wish the show wouldn’t make aliens homogeneous like this, as it makes it rather difficult to differentiate them. This one looks familiar. 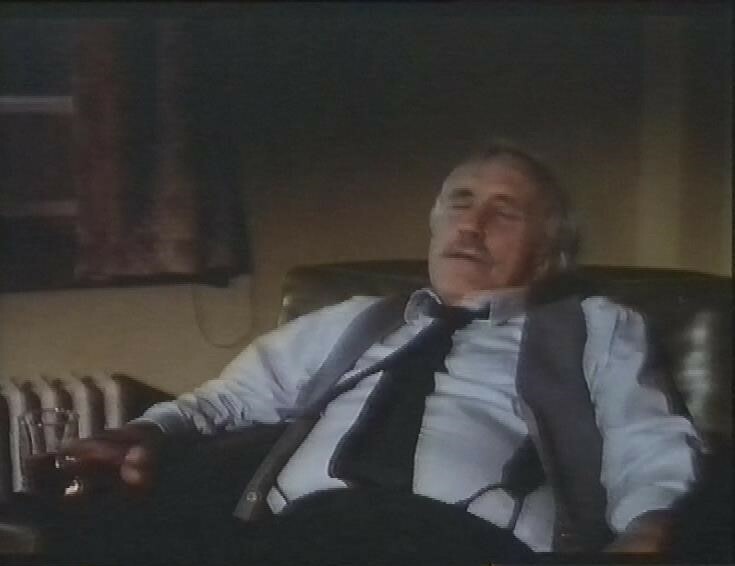 It’s Tim Preece, who also played Reggie Perrin’s son-in-law Tom. The men agree to go and help the Doctor. While they’re gone, something enters the ship, but whatever it is, it’s invisible. The men find the Tardis, and discover that it’s covered with a sticky substance, the result of the plants spitting at it, which is why the doors were blocked. The Doctor is rescued, and thinks he recognises the men. “Of course, you’re Thals.” “How did you know that?” I think it was the hair, personally. At least they’ve cut down on the makeup. There’s a bit of an exposition dump now. The planet is Spirodon. The Thals are on a mission. And the natives of the planet are invisible. They head back to their ship, then come across something invisible. Using a colour spray, they reveal what they’re up against. Daleks. It’s a classic Terry Nation script – put the Daleks in the title, then wait a whole episode to reveal that there are Daleks on the planet. 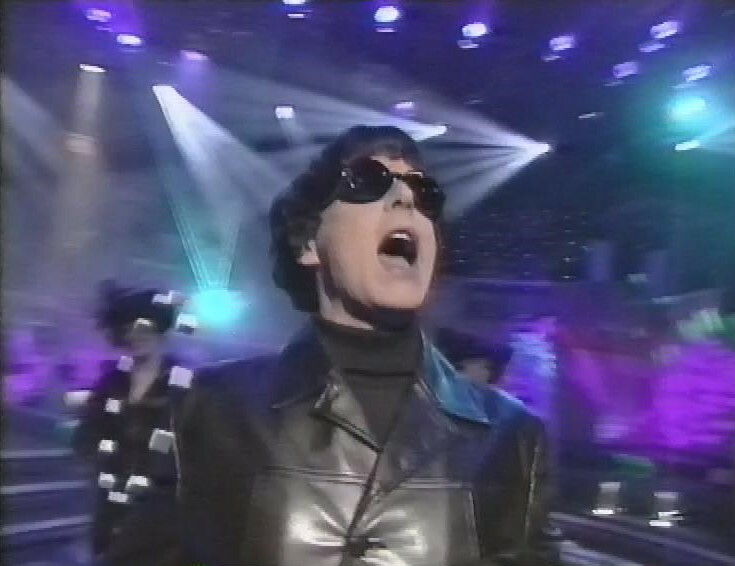 Before the next episode, there’s another special short programme, this time the Antique Doctor Who show. There’s some really interesting items, including a script from 1965, brought by one of the set designers who worked on the show. Then, episode Two. 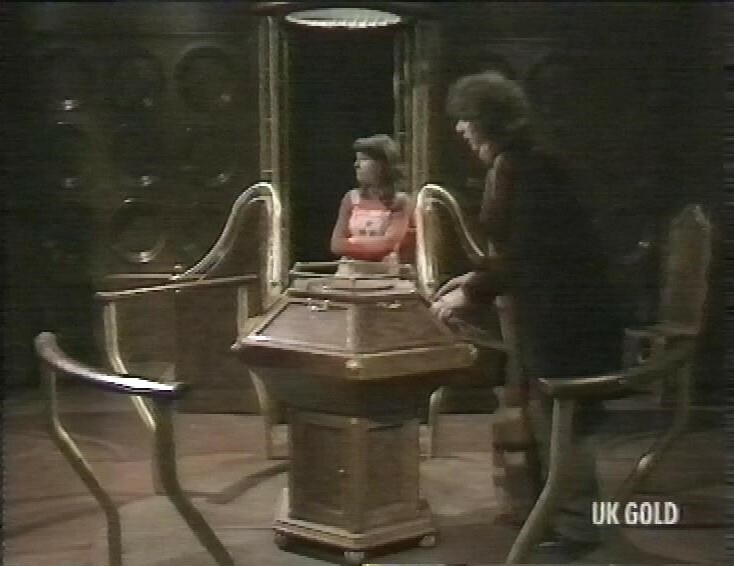 More Daleks are encountered, as they discover the Thals’ ship, and are about to destroy it when the Doctor tells them that Jo is still on board. They disable the Doctor and destroy the ship anyway. The Doctor is taken prisoner. 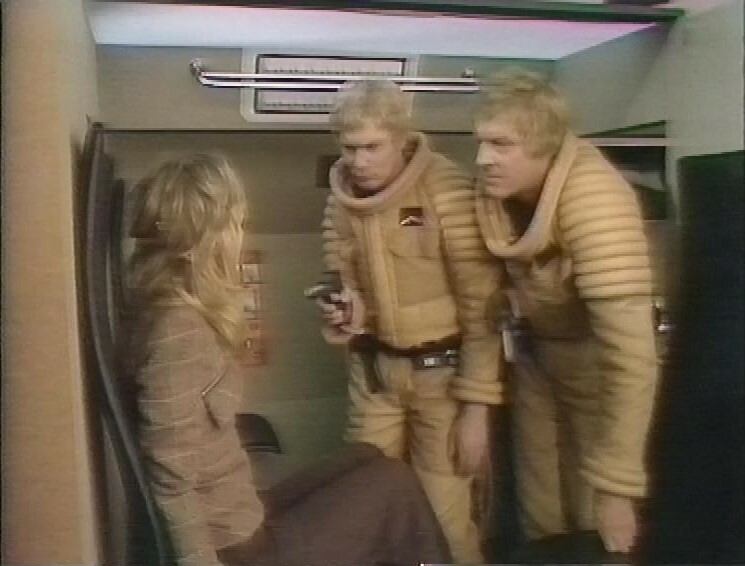 But Jo wasn’t on the ship, and she’s being looked after by an invisible Spirodon. They’re a bit friendlier than the Thals supposed. And the Thals find another of their number, a woman, who has come on a later ship to warn them that there are 10,000 Daleks on the planet. 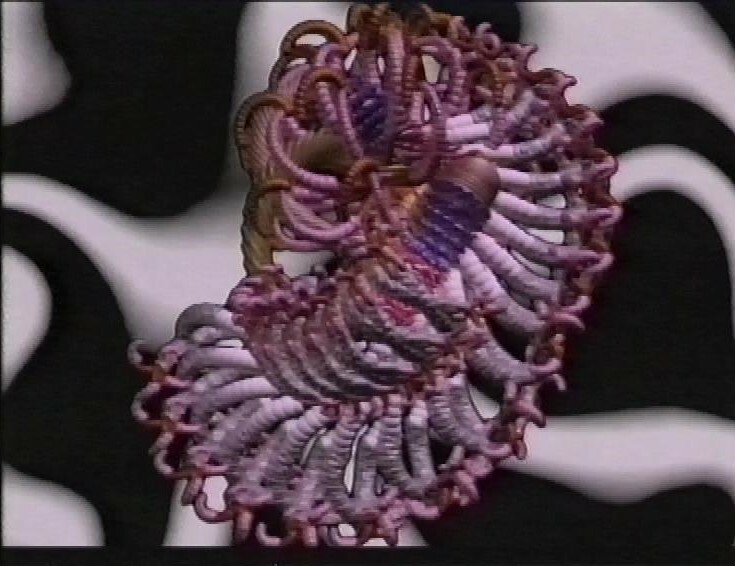 Before the next episode, there’s the end of Tomorrow’s World, and there’s an animated Magic Eye picture in place of the credits, while Howard Stableford reads out the credits (I spotted Simon Singh’s name in there). There’s another short programme, Missing in Action about the missing episodes. According to the description of this YouTube copy, “The documentary is shunned by Dr Who fans as it was edited in a style that made the contributors appear a little overly obsessive about their quest for the return of missing material.” But surely “overly obsessive” is exactly how you’d have to be to care about missing episodes. Although I can see their point. The contribution from Adam Lee, BBC Archivist, was quite sneery, and really makes you wonder why someone whose job it is to look after an archive isn’t more ashamed at the BBC’s spectacular lack of foresight. 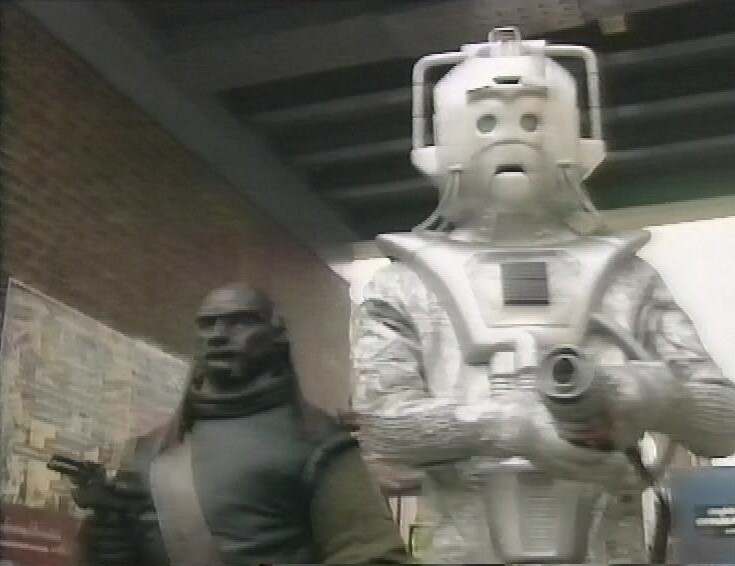 Episode three of the story is in Black and White, because the colour videotape master had been junked in the 70s. There’s a few Pertwee stories like this, although these days many of been recoloured by combining high quality film prints with lower quality VHS or Betamax copies (often from America) to restore the colour. This hadn’t been done for this episode. 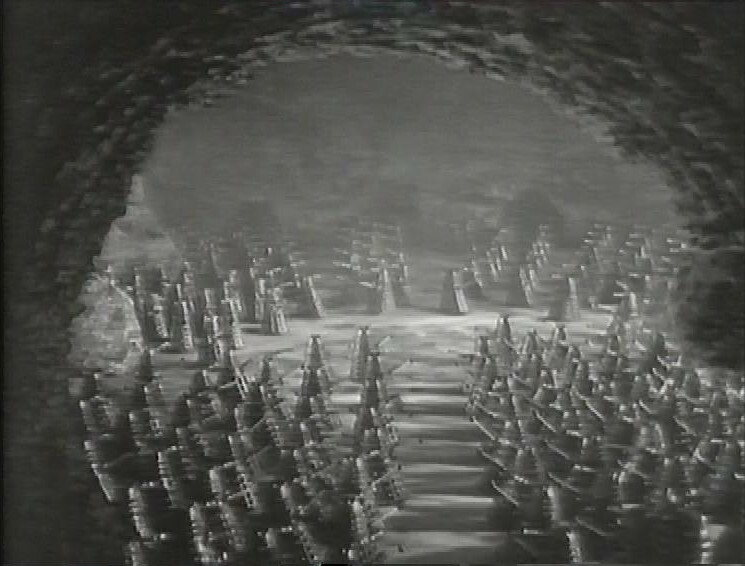 The remaining Thals spend a lot of time crawling through tunnels to get into the Dalek base to rescue the Doctor and their comrade. There’s an impressive shot of a lot of Daleks. The Doctor tries to rig a hot air balloon to take them out, but they’re too heavy and the daleks are coming. 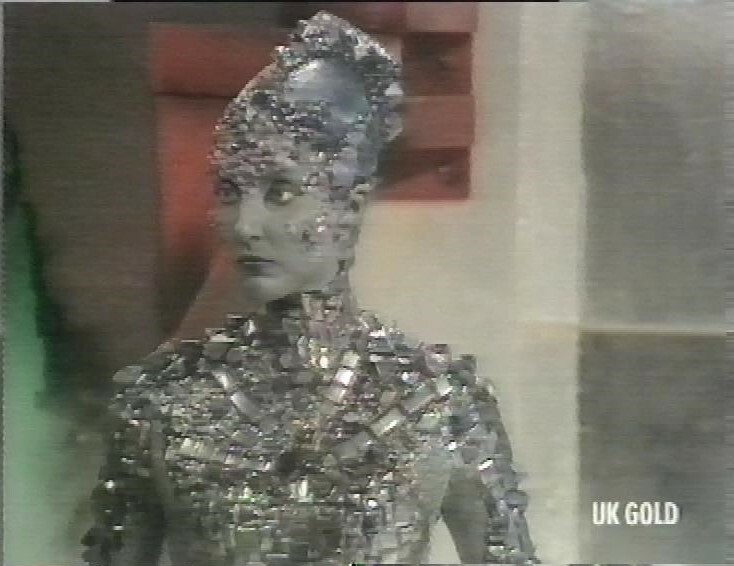 After this episode there’s a trailer for the BBC’s 3D Week, some of which we’ve seen on recent tapes. 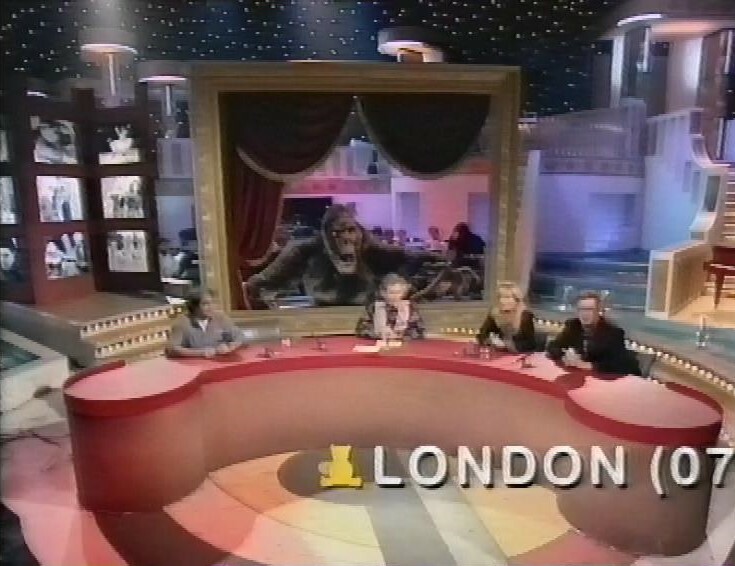 Then, before episode four there’s another mini programme called I Was That Monster. It’s lovely to see people like John Scott Martin, veteran Doctor Who monster performer. 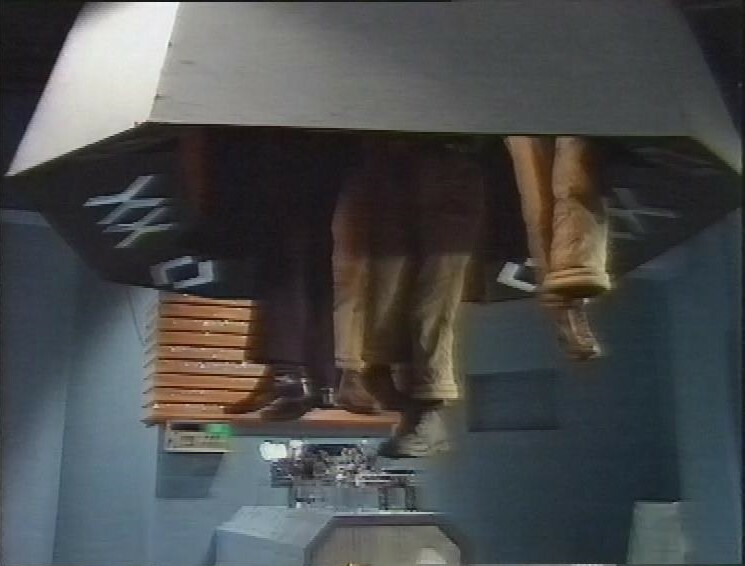 Then, Episode Four of the serial The Doctor’s plan does work, and the four of them escape very slowly upwards before the Daleks can get them. 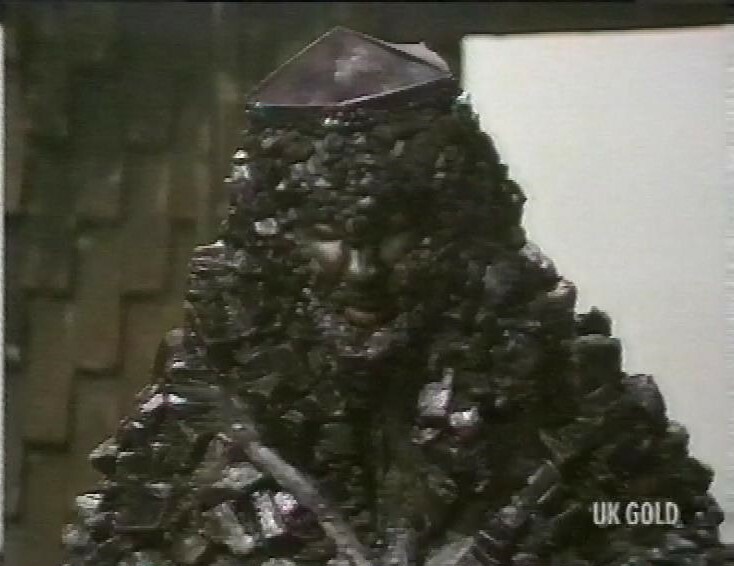 The Thals have a plan to blow up the Daleks, Jo is reunited with the Daleks, but Prentis Hancock is captured by Spiridon slaves with the explosives. Before the next episode there is another short programme, this time about the Master. The start of this is missing from my recording, which is a shame because the only YouTube recording I can find is the wrong aspect ratio. 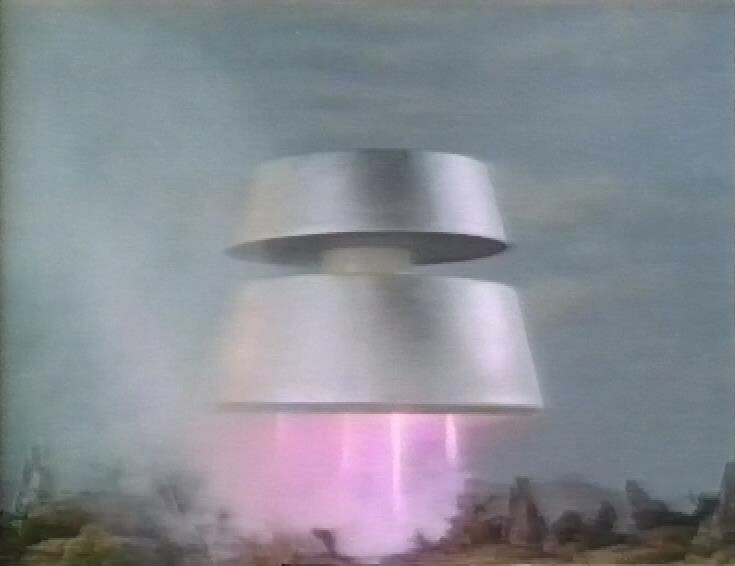 In Episode five, the Doctor tells the Thals that their plan to destroy the regfrigeration unit is a bad one, in that it will bring all the frozen Daleks on the planet to life. 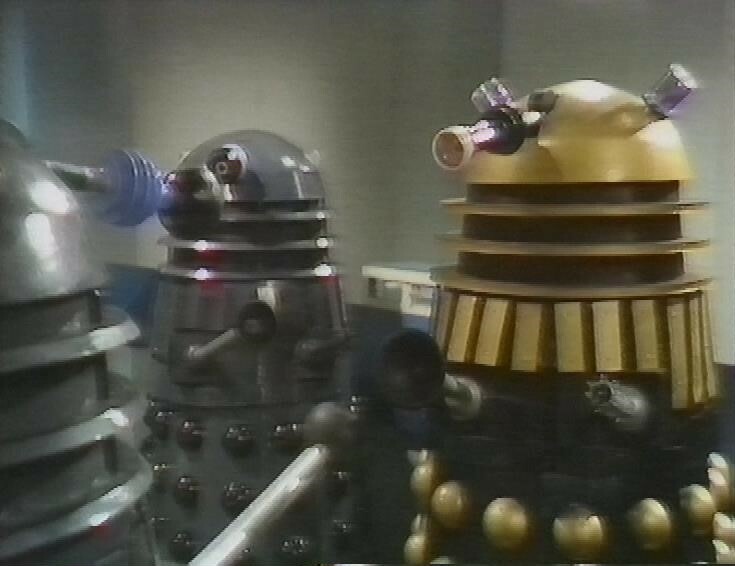 The Daleks have a plan to release a bacterial weapon to wipe out all life on the planet. They’ve got a treatment for immunity, which they apply to the Daleks and the Spirodon slave workers. There’s a lot of disguising themselves as Spirodons, who wear purple fur coats against the extreme cold. 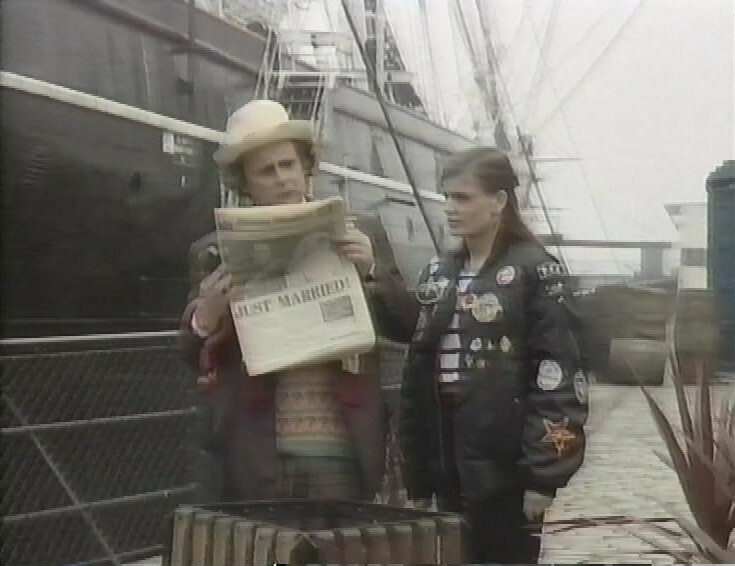 Before the next episode, there’s the end of the Tomorrow’s World Christmas Special, from Kingston, looking very Christmassy. There’s a trailer for Planes, Trains and Automobiles. And one for Noel’s Christmas Presents. Before the final episode of Planet of the Daleks there’s another short film. This one is a Unit Recruiting Film. 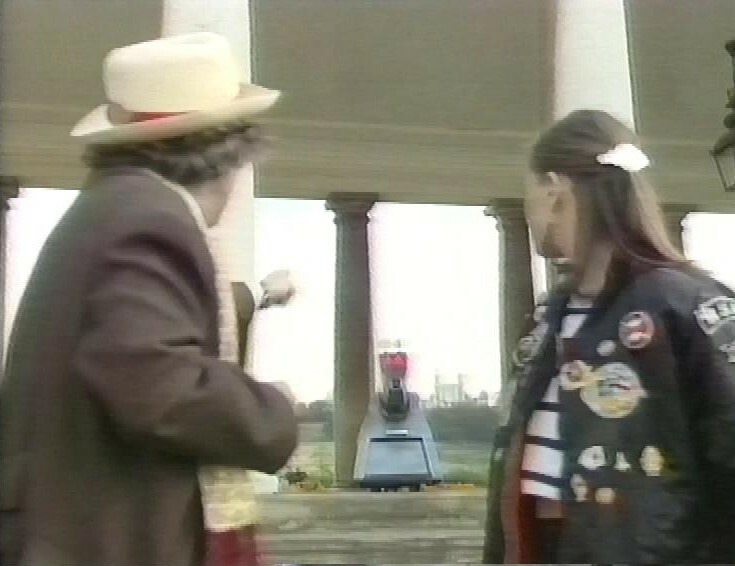 The final episode sees the Dalek Supreme visiting. Look at that model work. But the actual Dalek Supreme is looking quite spiffy. Like the Donald Trump of Daleks. When the Doctor and the Thals are successful in burying the Daleks in an ice volcano, the Doctor gices a nice speech to the head Thal, asking him not to glamourise the story of the war when he returns to Skaro. After this, recording switches to something very odd. It’s Living With The Enemy. It’s a Video nation-type of thing where families with teenagers talk about how hard life is when you all hate each other. I think I might have recorded it because it was produced by my friend Sean’s next door neighbour. After this, there’s a trailer for a QED Family Special because 1994 was Year of the Family. There’s a trail for the James Fox drama Headhunters. The tape ends after a minute or two of this. Some Doctor Who today, and it’s a special treat for Christmas Day with some quite important stories. 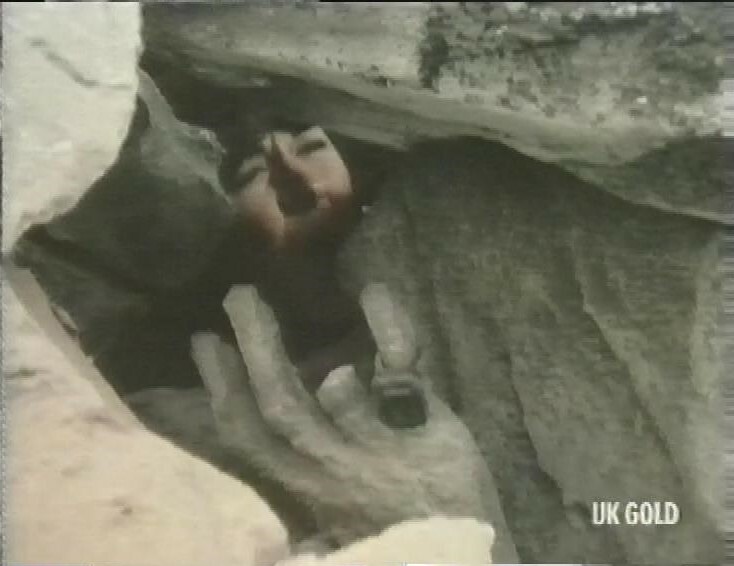 First, from UK Gold, it’s The Hand of Fear. It starts with some truly awful alien costumes. It’s like they just weren’t trying. They’re very concerned about the total obliteration of the traitor Eldrad, and how part of it has survived. After that oblique introduction, we’re back on earth, in a quarry! An actual quarry that’s being used as a quarry. Is that a first for the show? Sarah complains that it isn’t South Croydon. But she’s not complaining for much longer, as the quarry is being blasted, and she’s caught under loads of rubble. Next to a petrified, disembodied hand. while Sarah is unconscious at hospital, the Doctor investigates the fossilized hand – it appears to be silicon based. And Sarah has got its ring. She wakes up, and goes to find the hand. “Eldrad must live” she says as she zaps the doctor looking at it with a blue light from the ring. She pops the hand into a handy tupperware container and scarpers. “The young woman with dark hair, wearing pink-striped overalls. Yes, just like Andy Pandy.” Even the writers knew that Sarah’s costume was hideous. The Doctor, looking at the other doctor’s results, think the hand might be absorbing radiation, trying to regenerate itself. So it’s not good news when Sarah takes the hand to Nunton Nuclear facility, and takes it into the outer chamber of the reactor. Glyn Houston runs the facility. Always good to see Glyn Houston. 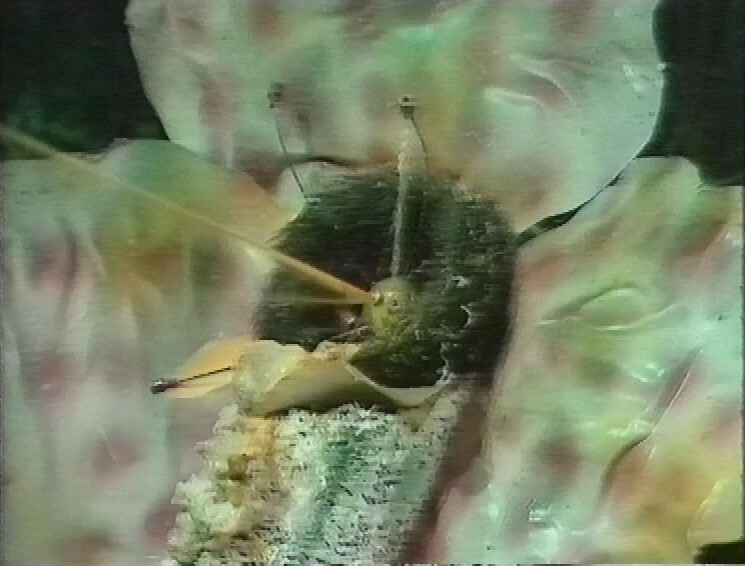 She keeps saying “Eldrad Must Live” and the doctor helping The Doctor also hears that voice, and he tries to kill the Doctor, but dies in the attempt. The Doctor manages to hypnotise Sarah to free her from Eldrad’s control, but another of the workers in the nuclear plant succumbs, and takes the hand and the ring deeper into the reactor. There’s a massive explosion, but the radiation has been absorbed by whatever is in the core. But things aren’t safe, because the government has ordered an air strike on the complex to bury it. Seems dangerous to me, but I’m not a politician. The air strike is neutralised, though. And we meet Eldrad at last. Not as much of a ‘he’ as everyone has assumed. Eldrad wants the Doctor to take her back to Kastria, back to the time before she was obliterated, but the Doctor refuses, agreeing only to take her back to Kastria in the present. Oh look, it’s the secondary console room. When they get to Kastria, Eldrad is hit by a booby trap that leaves her dying. She has to get to the regenerator. But there’s another presence on the planet, watching them. Trying to stop them. Eventually, Eldrad makes it to the regenerator, regenerates, into a He. 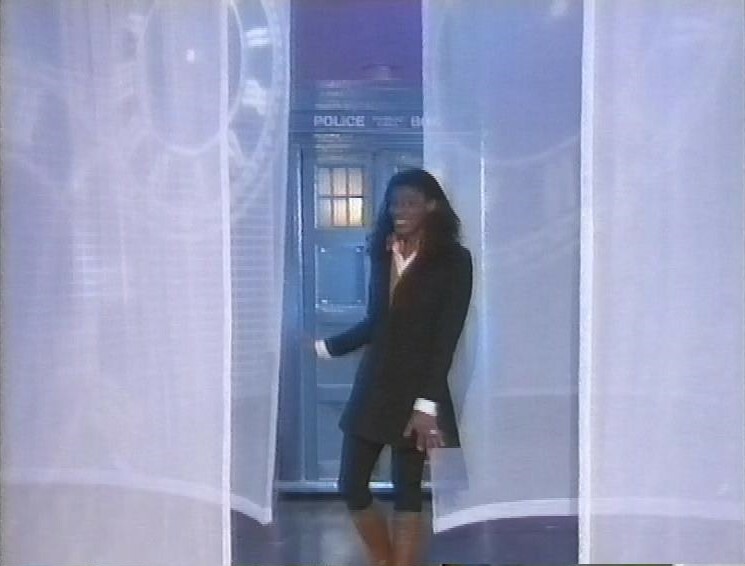 Nice to see Doctor Who tackling Trans issues so long ago. But the Kastrians died out a long time ago, so Eldrad is the King of nothing, and when he threatens to travel to Earth to enslave them, the Doctor and Sarah defeat him by tripping him up with his scarf. 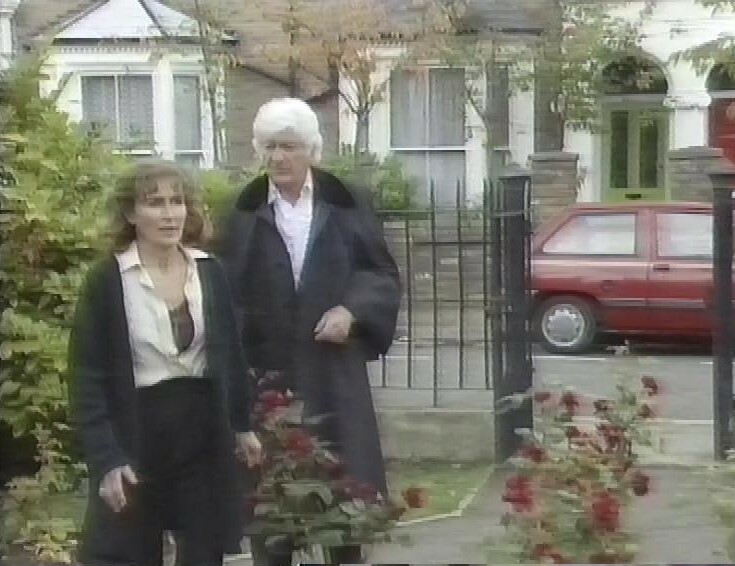 And, of course, this story ends with Sarah Jane Smith leaving the Tardis, as the Doctor is called to Gallifrey. Which always makes me cry. After this, there’s a trailer for The Deadly Assassin, then next story in sequence. Then, recording switches to something that was, at the time, utterly momentous, and deeply disappointing. It’s Dimensions in Time. 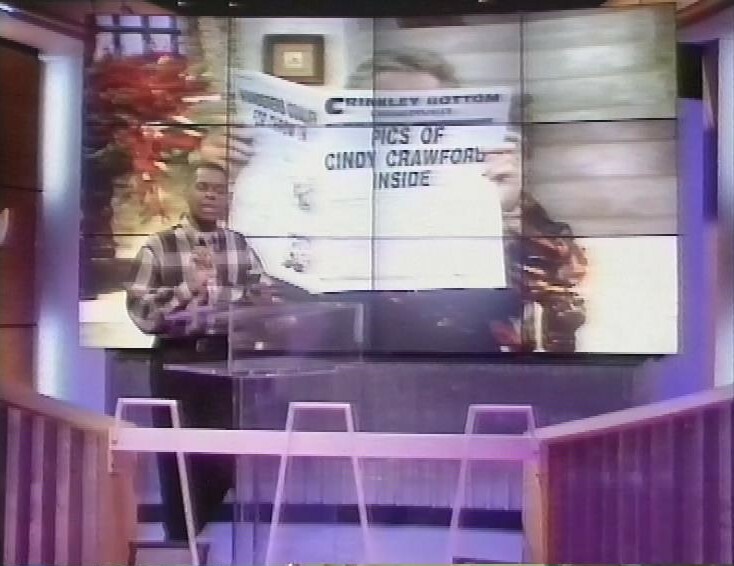 Introduced as part of Children in Need by Andi Peters, and beginning with Noel Edmonds on the House Party set. 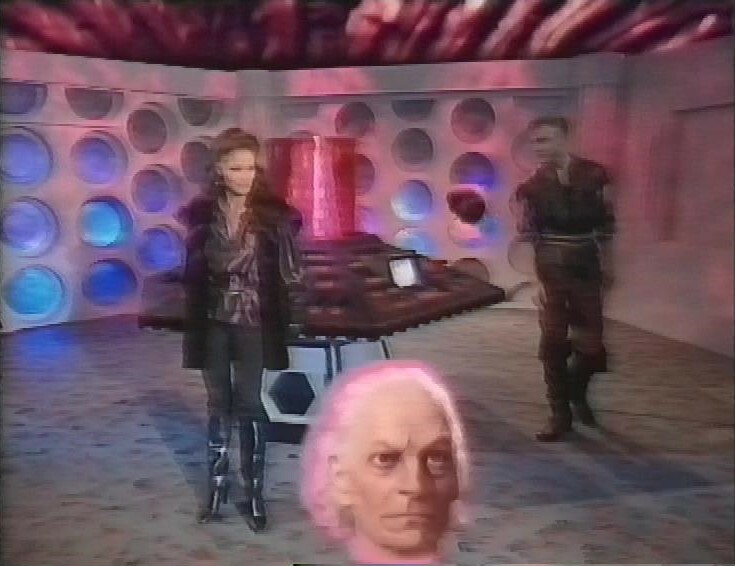 It’s all supposed to be in 3D, so here’s Kate O’Mara as The Rani, in her Tardis, with CGI heads of William Hartnell and Patrick Troughton spinning around. 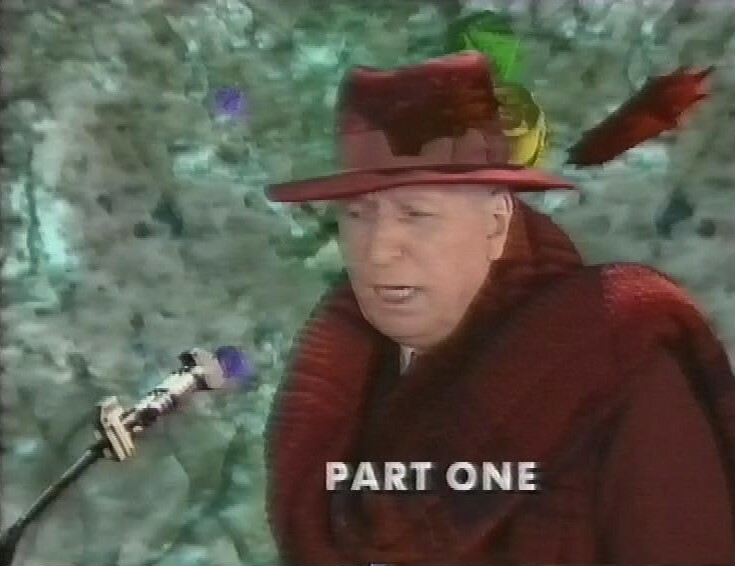 Tom Baker did all of his bits in a studio. 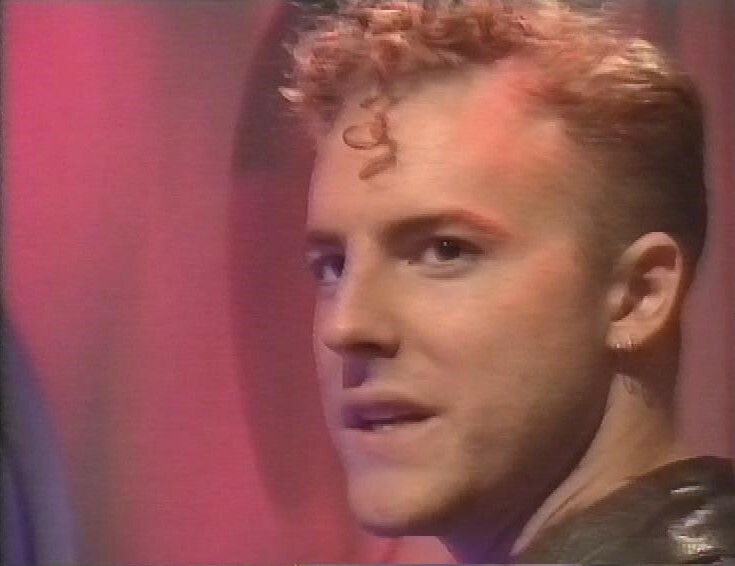 The Rani’s sidekick is a young Samuel West. They’re in 1973 near the Cutty Sark. But not for long. 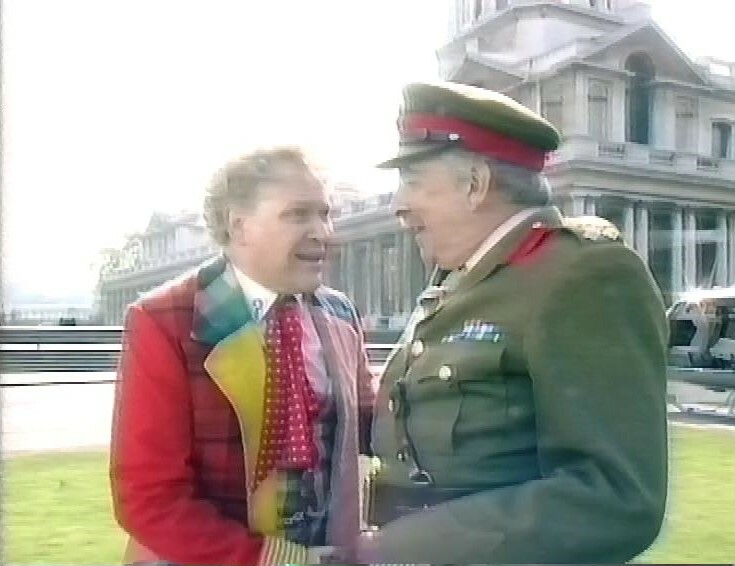 All of a sudden, McCoy is gone, and Doctor Number Six is there, Colin Baker, with Aldred. 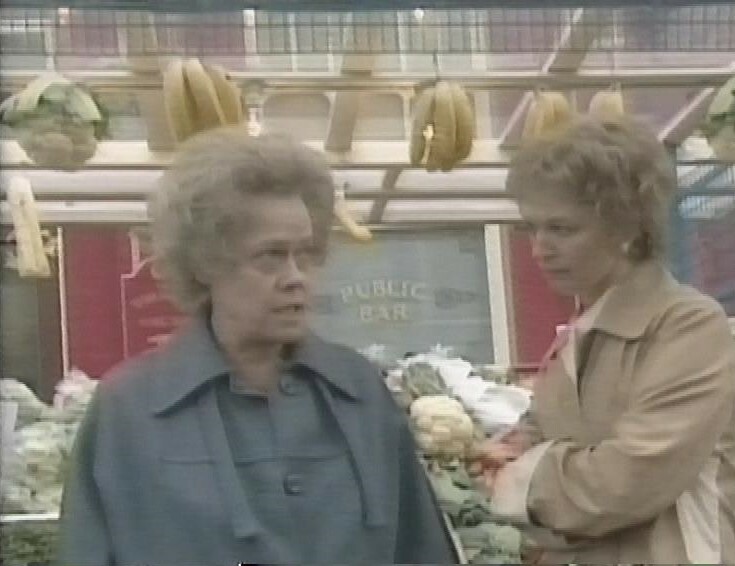 And they’re in Albert Square. Yes, in true Children in Need tradition, it’s a crossover. 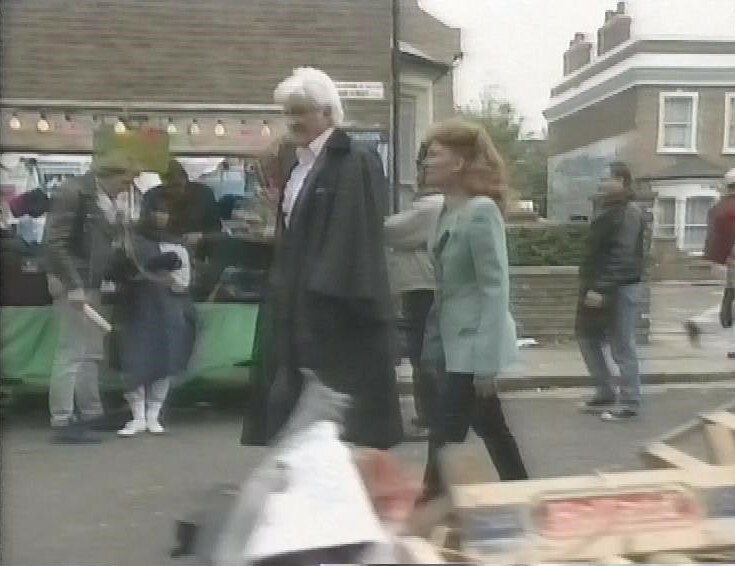 And what a strange crossover, as the narrative slips another time groove, and we’ve got Jon Pertwee talking to Bonnie Langford as Mel Bush. Of course, Langford is now in Eastenders herself. 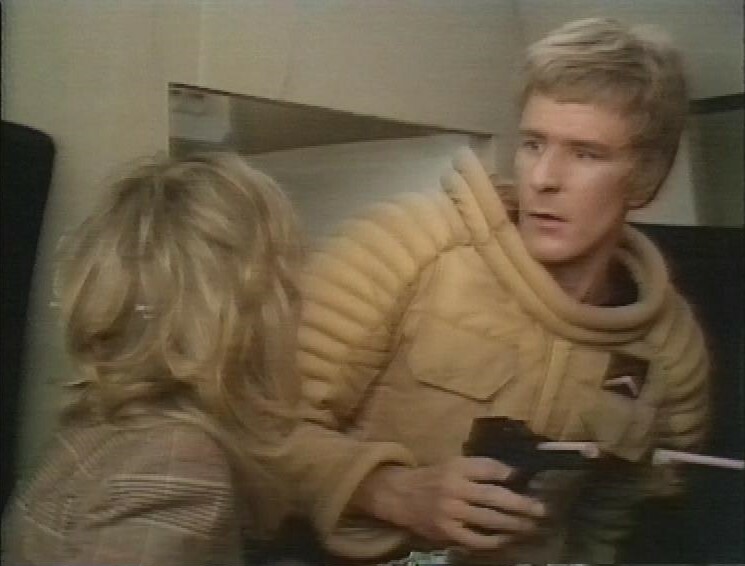 This is a ‘future’ Walford, though, as evidenced by Wendy Richard and Gillian Taylforth. It’s 2013, a couple of years before Langford did actually join the cast, so we can’t claim any weird synchronicity here. 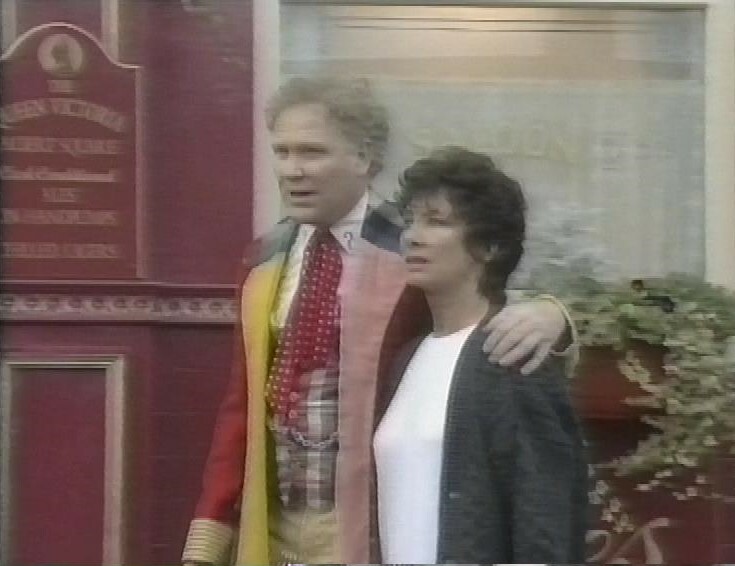 Then, back to Colin Baker, this time with original companion Susan (Carole Ann Ford), and they’re now in 1973. 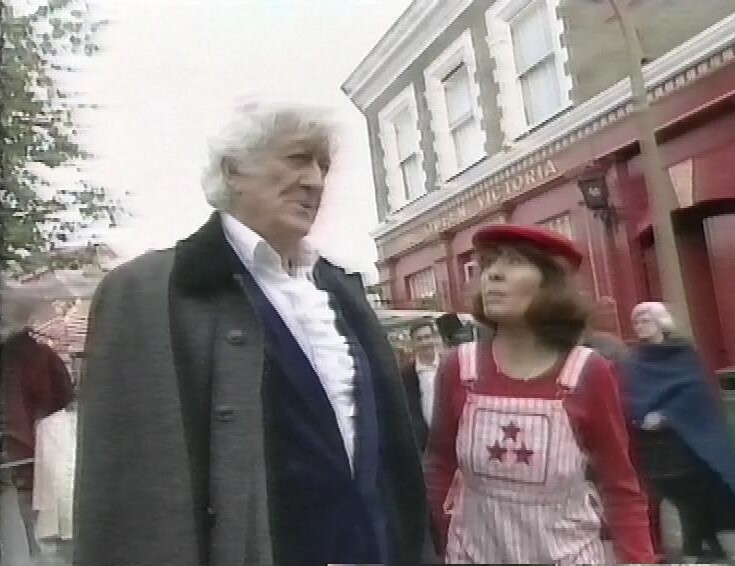 And now, Pertwee’s back, but now with Sarah Jane Smith (Elisabeth Sladen) in her Hand of Fear costume. You’d think she would have changed out of that by now. But at least it showed the production team were making some kind of an effort. 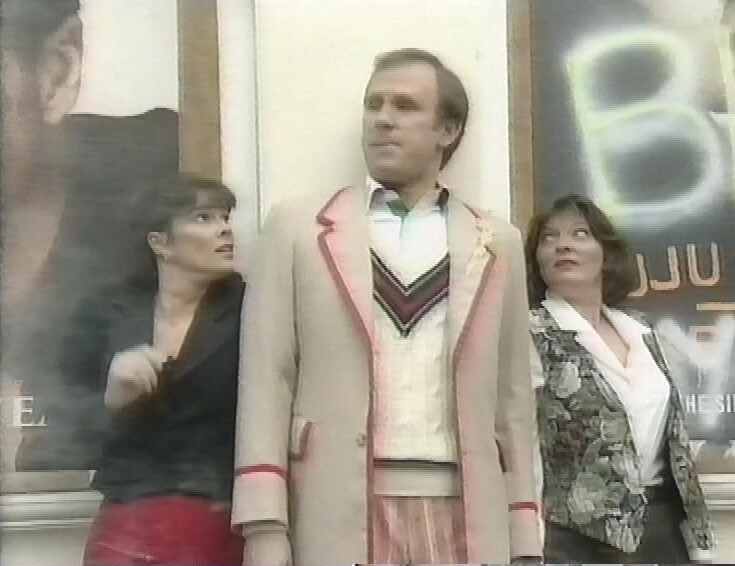 Peri (Nicola Bryant) Nyssa (Sarah Sutton) and the fifth Doctor (Peter Davison) are menaced by a Cyberman and an Ogron. 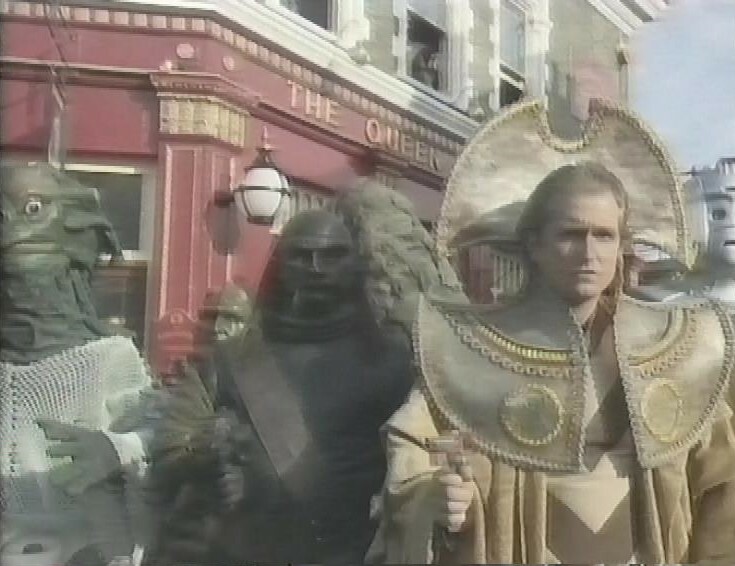 Presumably the costumes they could get from one of the Doctor Who exhibitions around the country. “Have you any idea where we’re going?” asks Peri, echoing the audience of the writers. 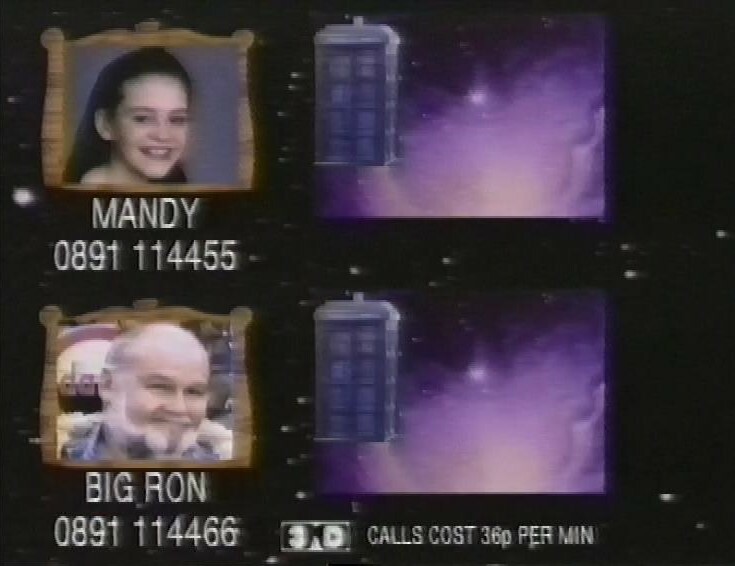 After the end of part one, there’s even a phone vote where you can vote for who helps the Doctor. 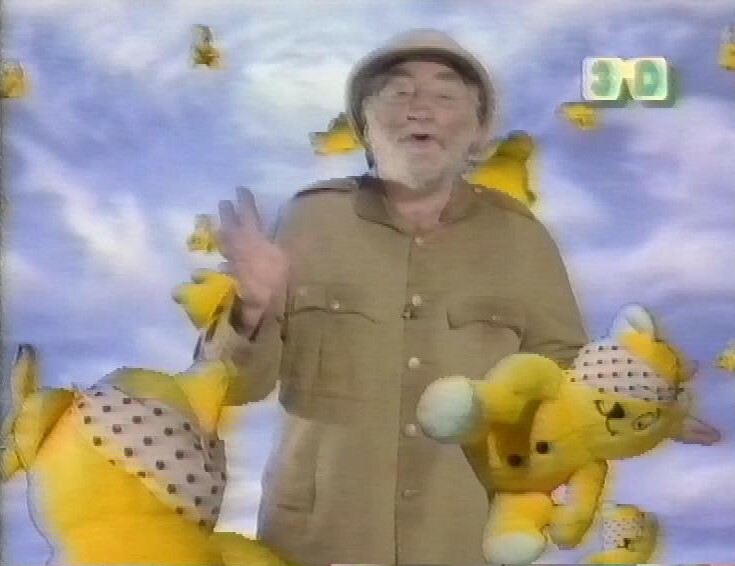 After this bit, there’s some more Children in Need 3D stuff, featuring David Bellamy. There’s also some 3D from Venice, with narration by Simon Mayo. 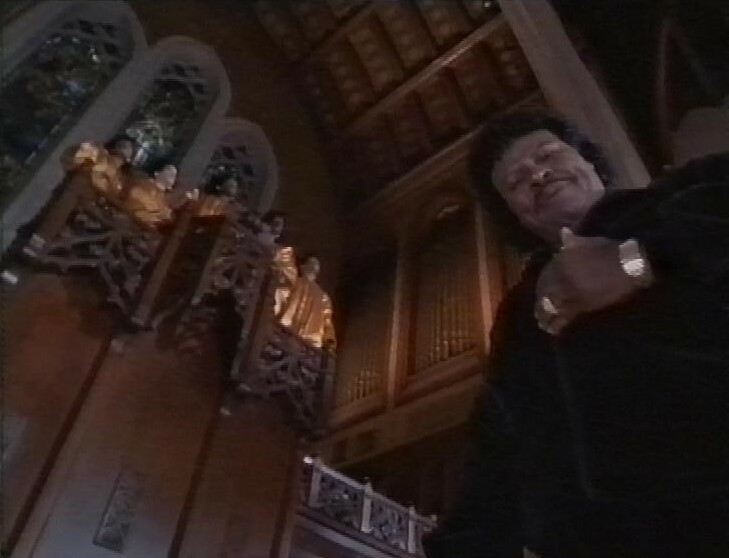 And a segment with Jeremy Beadle. 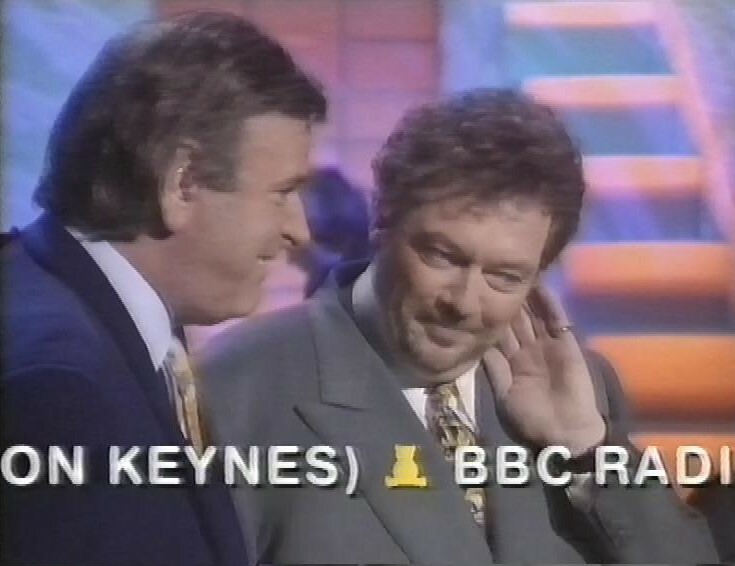 I liked Jeremy Beadle, mainly because I used to listen to his LBC Sunday night phone-in, which seemed slightly subversive when I was a teenager. He’s there so some of the ‘victims’ of Beadle’s About can have their own back on the people who nominated them. Then there’s the Pet Shop Boys performing I wouldn’t Normally Do This Kind of Thing. After this, there’s a reprise of the ending of the first part of Doctor Who, and another call to vote for part two. 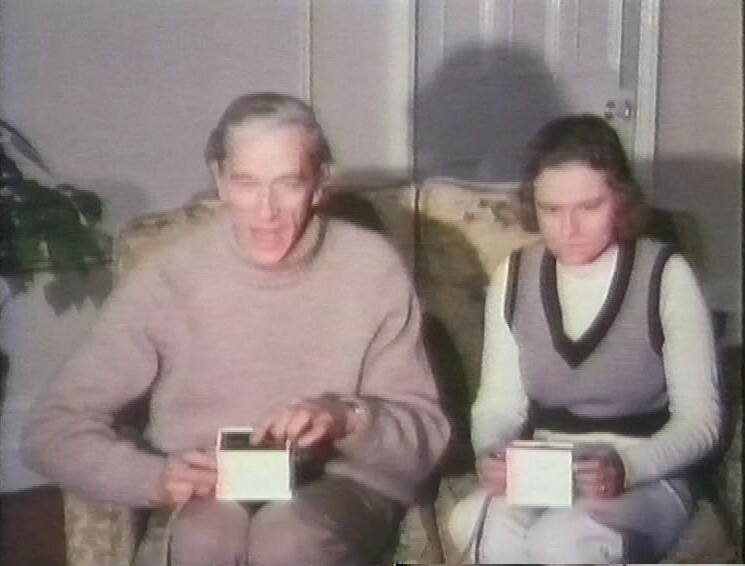 Next, and tying in nicely with the KYTV tape from a couple of days ago, there’s an appearance by the HeeBeeGeeBees. 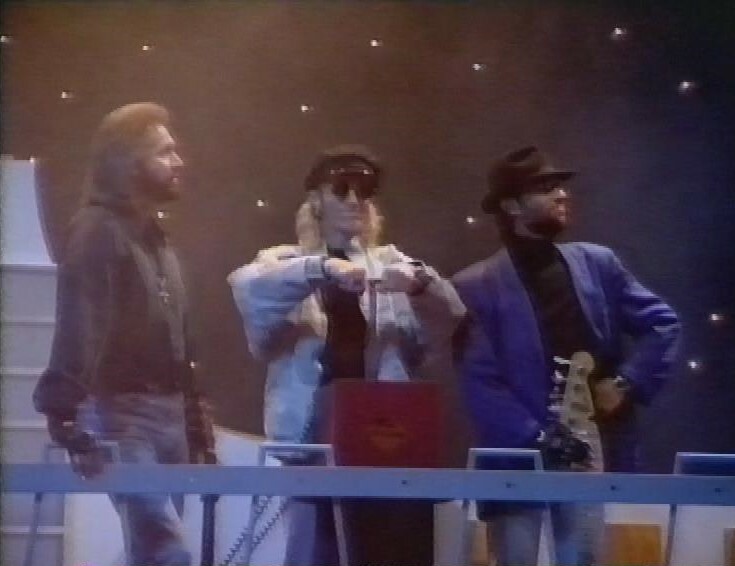 And an appearance by the actual Bee Gees, who blow them up. 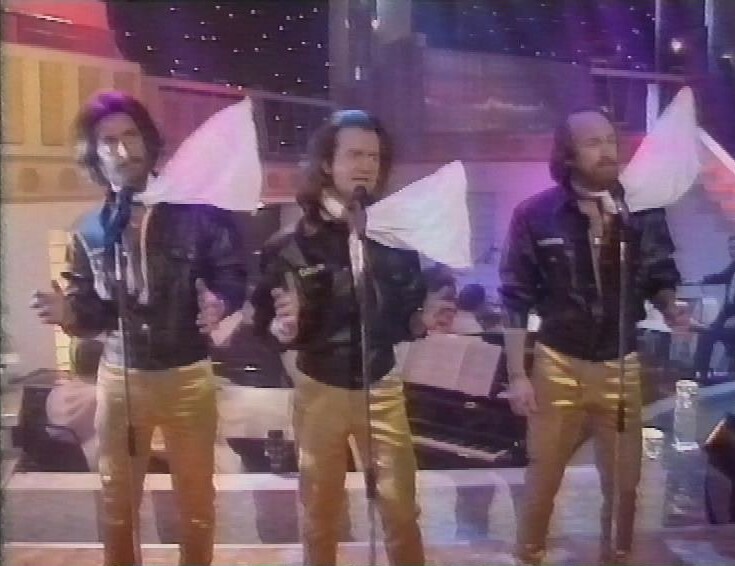 I didn’t bother recording the actual Bee Gees’ performance. Then, there’s a segment of a quiz hosted by Mike Smith. I think it’s That’s Showbusiness. It’s supposed to feature Danny Baker and Loyd Grossman on one team, versus Chris Evans and Gaby Roslin on the other, but they lost Loyd Grossman. It’s not that he didn’t turn up, he was there and they were all together before the broadcast, but he disappeared just before. He does turn up shortly, though. After this, it’s over to Noel’s House Party on the following day, for first, a reminder of the phone vote numbers, then for part 2 of Dimensions in Time. Here’s Pertwee’s first companion, Liz Shaw, played by Caroline John. 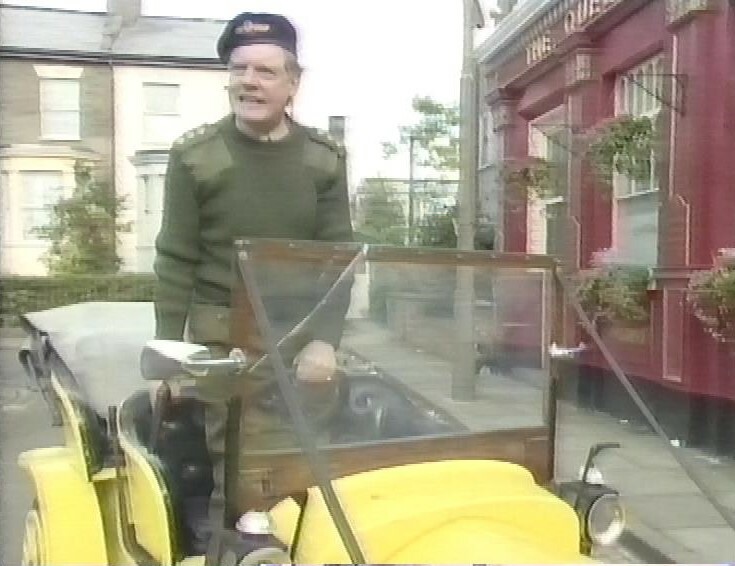 Richard Franklin as Captain Mike Yates, along with Bessie, the Doctor’s car. And what multi-doctor romp would be complete with the Brigadier, who arrives in a helicopter, which probably took up almost all the show’s budget. Troughton companion Victoria (Deborah Watling). 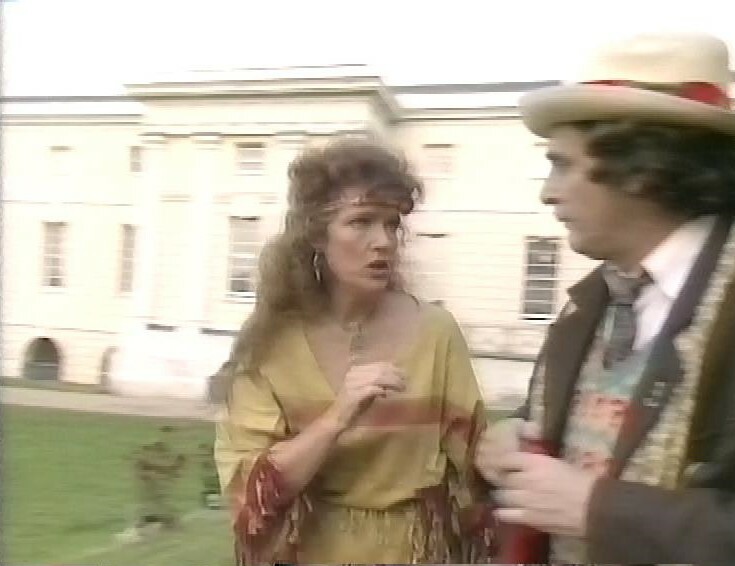 Louise Jameson as Leela didn’t quite get the same costume – it looks more Sioux than Sevateem. Even K9 makes an appearance. This really is the biggest load of old tosh. And if the show had still been on the air, it would have been received as the playful CiN skit that it truly was. But the show had been off the air for several years, and this appeared not long after there was a supposedly serious attempt by BBC Worldwide to produce a one-off TV special, another multi-doctor story, called The Dark Dimension, but this one focusing on Tom Baker’s doctor. It didn’t get much further than initial planning, but there was a script, and veteran Who director Graeme Harper was going to direct it. But it was spiked by a combination of poor diplomacy – the other Doctors weren’t happy at their parts being no more than a “cough and a spit”, and the BBC proper didn’t like the idea of BBC Worldwide making their own productions. Then, as this one fell apart, former producer John Nathan-Turner brought his own proposal for a glitzy multi-doctor one-off, cleverly tied it into Children in Need, tied it in with Eastenders (his partner, Gary Downie, was floor manager for Eastenders at the time) and to pour salt into the fans wounds, called it Dimensions in Time. But the most mind boggling thing about the whole thing is that there are two credited writers. Oh well. I’m over it now. 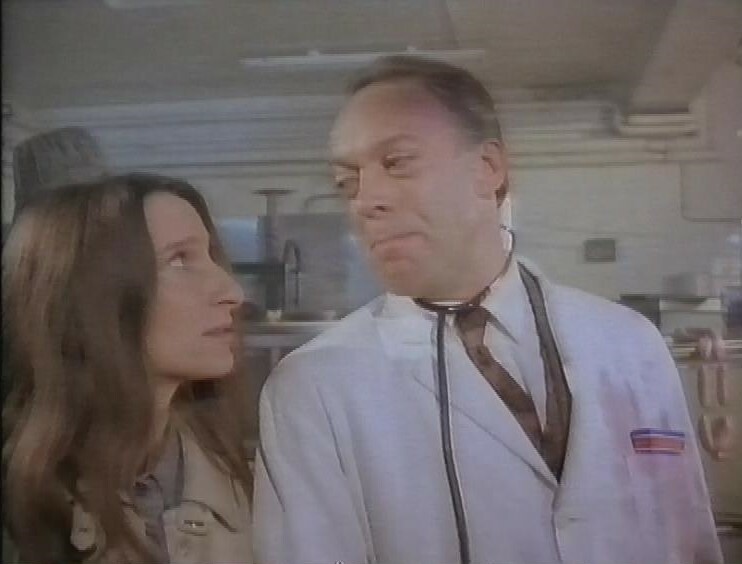 A few years later, Comic Relief did a Doctor Who story, The Curse of Fatal Death, and it was a thousand times better as a Doctor Who story than this, despite actually being a comic parody. But then, it was written by Steven Moffat, who apparently was a bit of a Who fan himself. After this, recording switches to Channel 4 and a FourMations programme called Secret Passions. 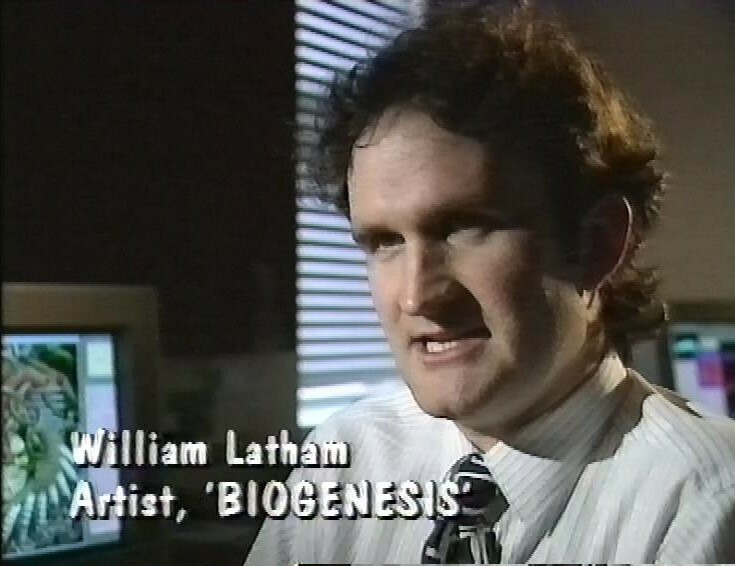 It’s about computer technology and animation, and among the people featured is William Latham, who had a whole career making swirly ‘biological’ animations, and even started a games company in the 90s that a friend of mine worked for. The images are freaky, but I’m not sure they’re much more than that. I don’t have all the programme here – after the Biogenesis short has played, the recording cuts off and we switch to the end of a news bulletin. There’s a trailer for Around Westminster. And a trailer for Saturday Night programmes. Then, Tomorrow’s World looks at how the 3D TV effect works (or maybe doesn’t). It has a look behind the scenes of Dimensions in Time too. After this, another recording, in Channel 4 with Pixar’s short Tin Toy. This recording stops, and underneath there’s the end of that episode of Tomorrow’s World. Among the stories, there’s a report on the repair mission to the Hubble Space Telescope. After this, recording stops, and underneath there’s part of an episode of Whose Line is it Anyway. This is followed by the start of Brides of Christ, a drama about catholic nuns, starring Brenda Fricker. 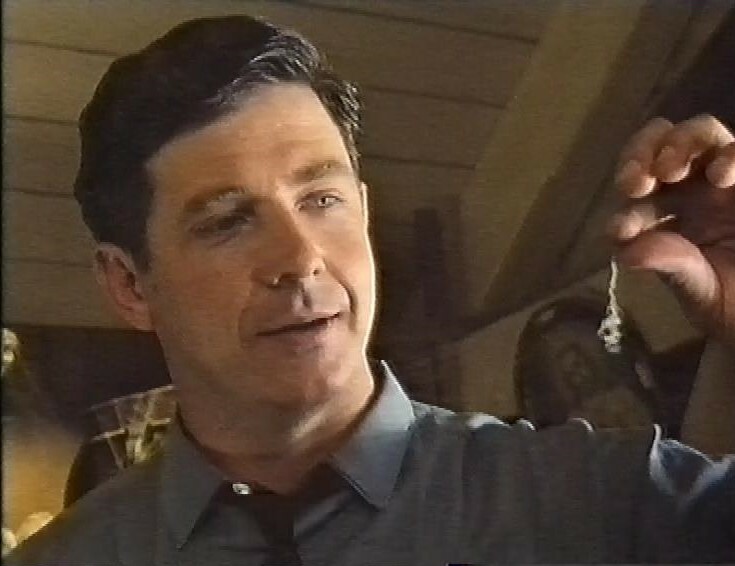 It also features Philip Quast, of Ultraviolet fame. The tape ends during this.